We had a fairly difficult week tbh on the full moon. Lake is very beautiful great host and great food cant fault it. 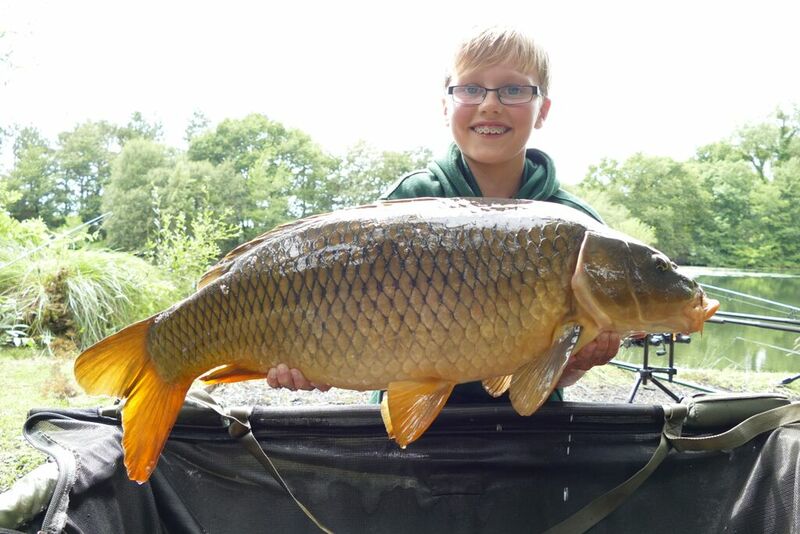 We had 33 Carp up to 45lbs. Average over 32lbs and we lost 8 fish. Bait HEAVY!!!! 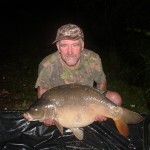 and rest swims, 3 of us went through 50kg of lake special boilies. Absolutely perfect for all out needs. 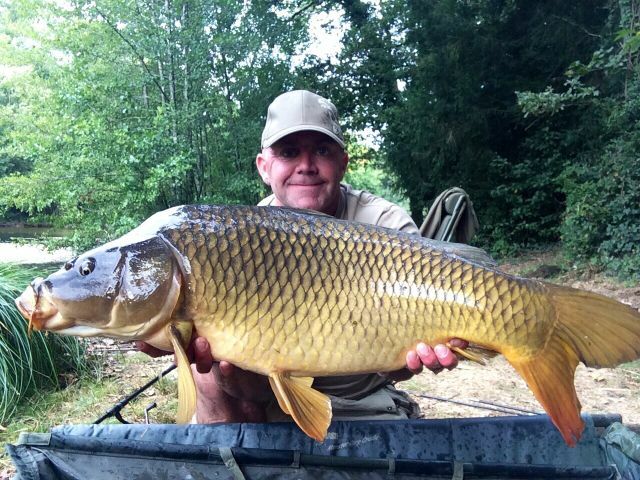 Cracking Venue, Fishing was great for the week, fish all in great condition. Dan and Cheryl perfect hosts and listen to dan’s advice about the lake we did and had a fantastic week. Also the food was fantastic every day Cheryl is a cracking cook. 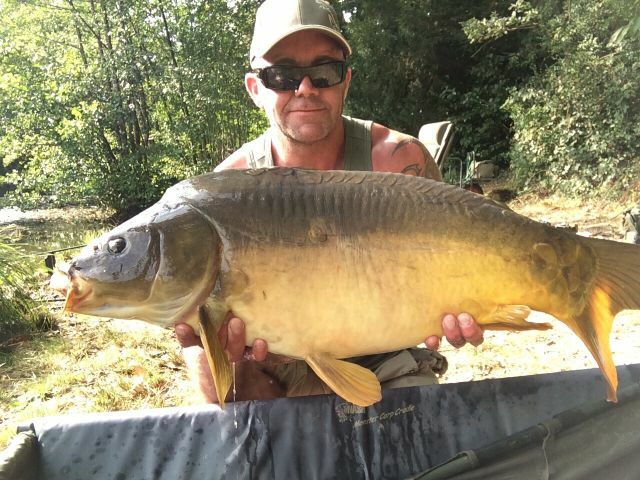 Good owners, nice looking lake and fish stat burst mirrors, had hoped for a few more but thats fishing, i gather its been a long time since the lake had any rainfall but still had a new Pb! 12 fish up to a new record for me of 39lbs. Some stunning commons too and a linear. 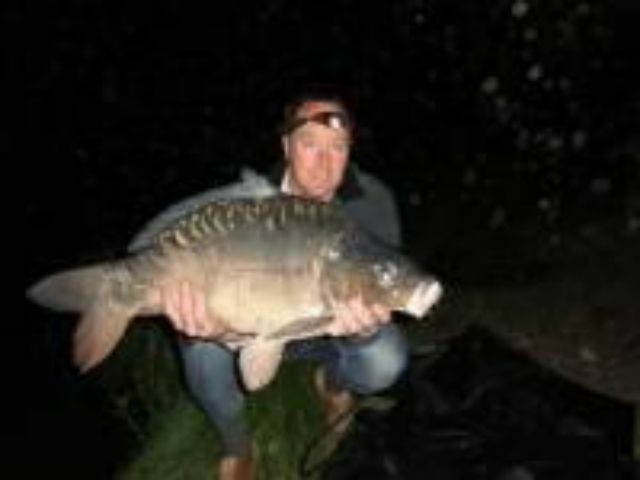 I fished mainly at night and the wife and i explored the wonderful beaches in the day that are about 45 mins away was a perfect mix of fishing and days out. Lake itself is very private surrounded by mature woods stunning, all the fish i caught were beautiful we will return for another trip. Setting is super, good mixture of fish, good mouths on them too, food is simply a must, very welcoming hosts, listen to what the owner has to say he knows his stuff. 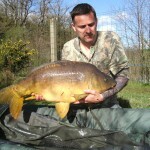 Beautiful estate lake, we lost a fair amount of fish as the line i bought before the trip keep breaking when i hooked a carp. We used the house bait fishmeal boilie resting areas and baiting. 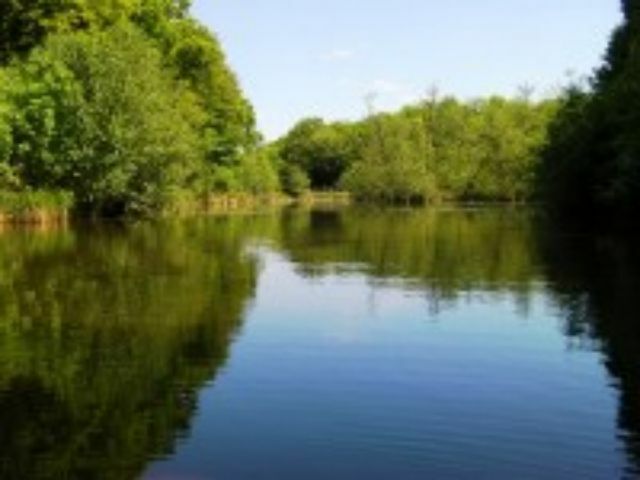 Peaceful beautiful setting in mature woodland easy access to swims plenty of features old lake. The fish are in great condition and the food was amazing. Well recommended. 16 Fish to 44lbs average weight for the week over 30lbs. 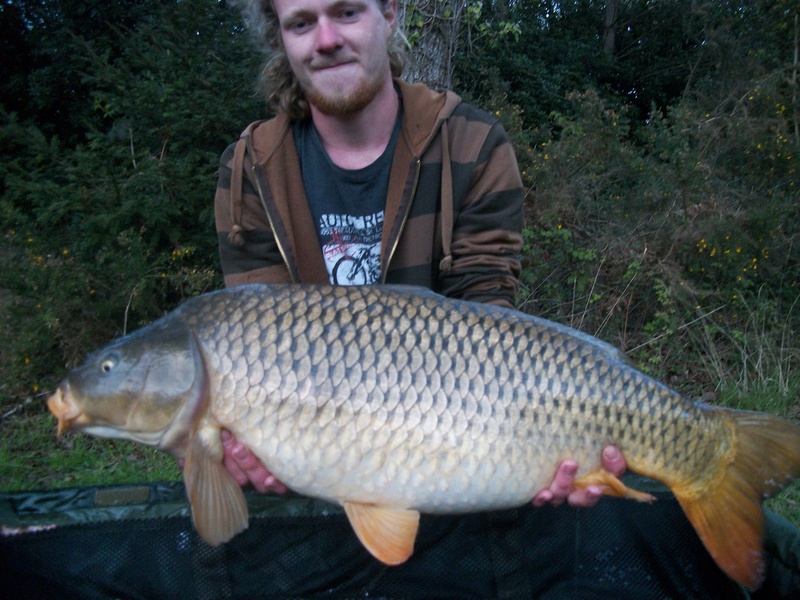 Commons mirrors and a linear. 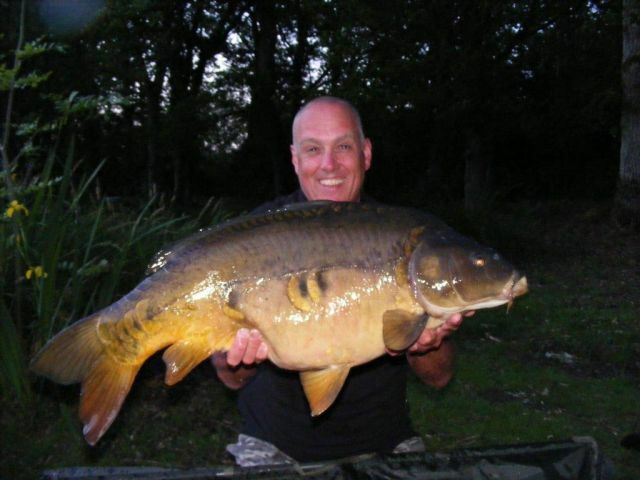 Top class fishery lake beautiful, fish amazing condition and food 1st class perfect break away thank you. Peaceful setting, lovely lake terrible weather Rain, rain and more rain. Fish generally came in the clear patches in the weather. 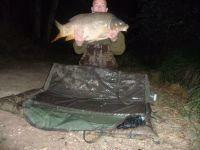 Bottom baits fished off a main bed. 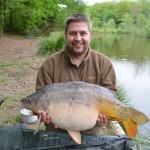 Very nice looking lake and fish in good condition that fight hard! Comfortable swims, easy access with plenty of water to fish helpful hosts. Beautiful lake, food to die for! 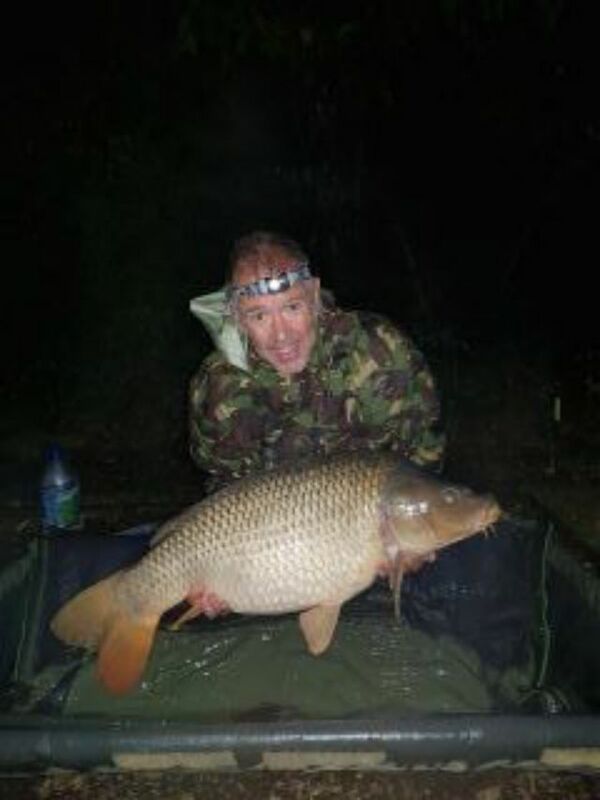 Fish in great condition, once i found the fish the action dramatically picked up 4 takes in one night. 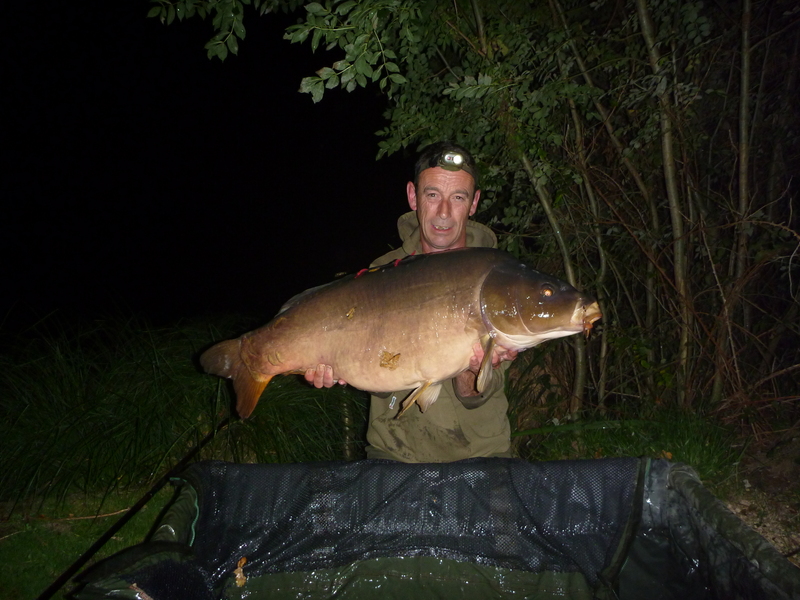 We had 10 fish and lost 5, Biggest was a beautiful two tone mirror of 46lb 8oz the rest were 30′s and mid to high twenties. 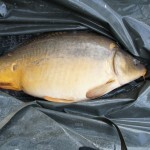 I also fished a centre pin for the tench and rudd and had a fantastic time. 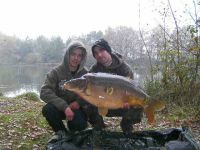 We were made very welcome and given lots of advice and help regarding tactics and places to fish. We both broke our PB’s and Cheryl’s cooking was amazing! Thanks for a great time, we have fished so many lakes over the years and the food was simply the best ever! Wish you both all the best in the future. yes plenty of hot water everything we needed. Lovely old lake, the longer i was there the more i fell in love with the place. Its only 5 acres but the are plenty of features it has character. Dan and Cheryl really nice people one of the best angling lakes i have visited as a package. 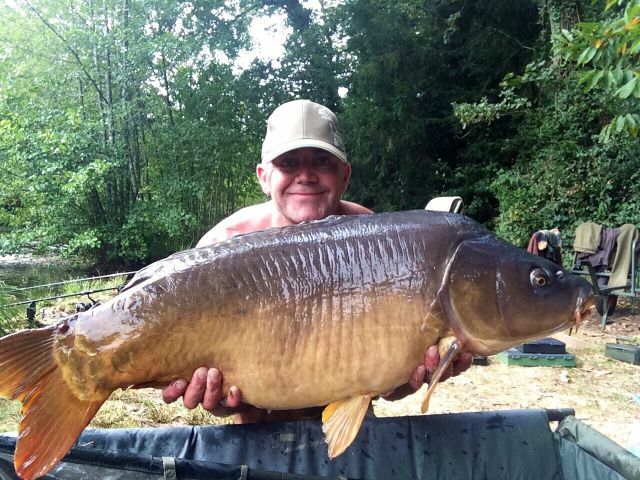 Carp in loverly condition i have booked my week for next year. We employed different tactics throughout the week from bags to baited areas one thing i would say its a good lake for baiting little corners. Very pretty lake to spend a week, caught some of the residents and ate some great home cooked food. 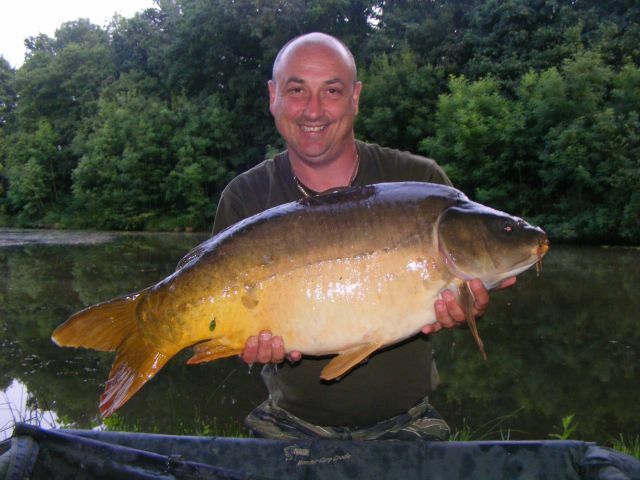 I used a boilie only approve due to the large rudd present i was using 2 of the different boilies produced on site. 3 day stint been before but the place keeps evolving, Dan is always making improvements and cheryl’s cooking is amazing went home a stone heavier!! 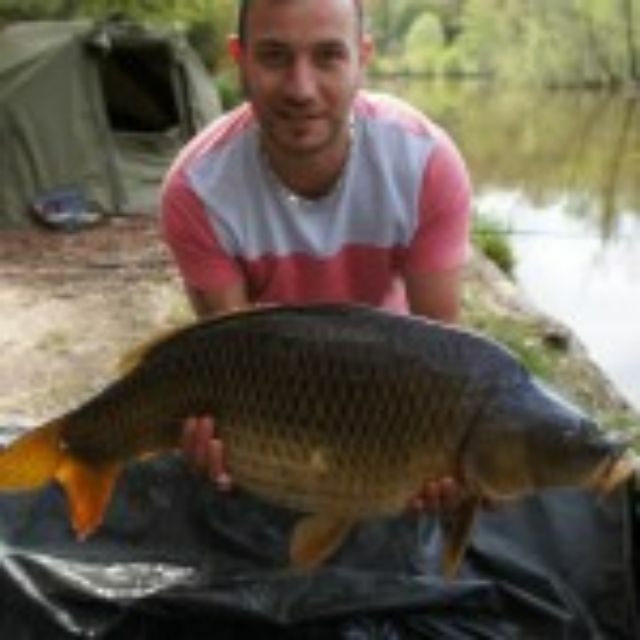 Good holiday, nice place well set up great food and fresh bait. I loved the place and booked my week for next year. 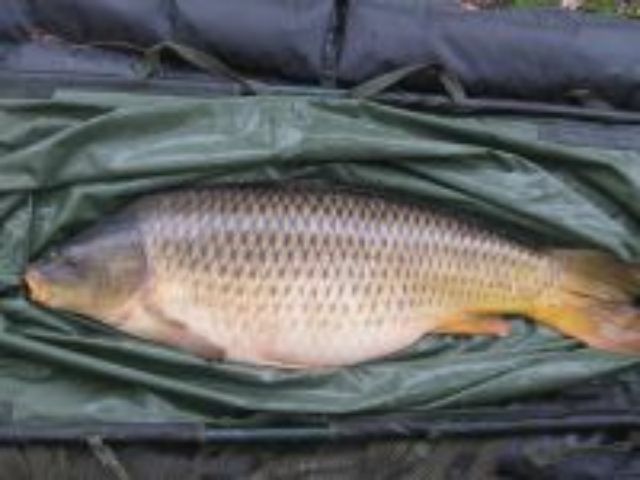 Carp are mint and the food package is a must. 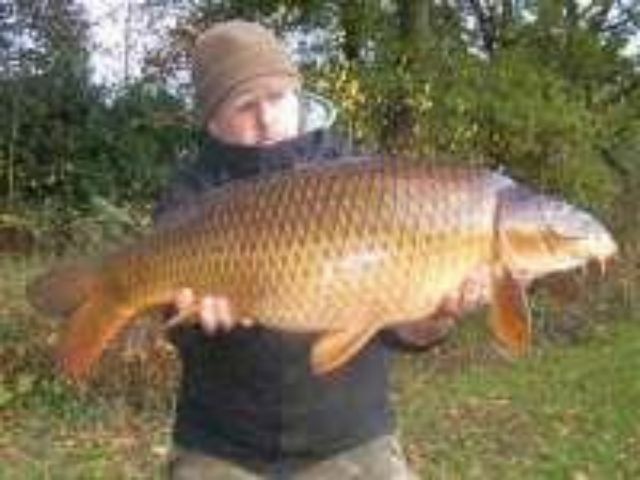 Average size was great and beat my personal best i loved the dark commons and caught one of the linears which was stunning. Stunning place and the food package was superb. 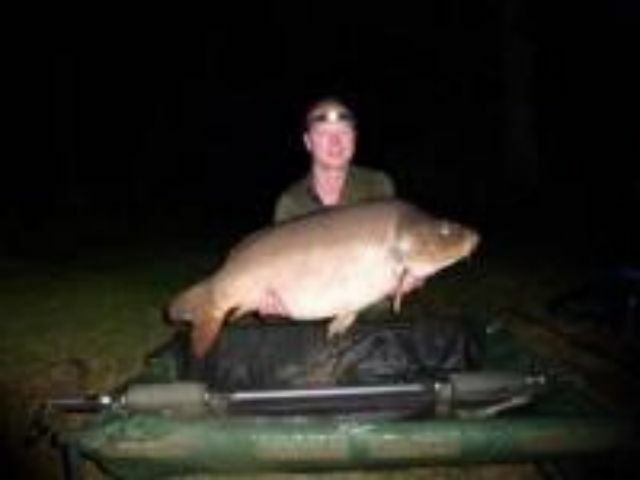 Carp to high thirties very hard fighting be warned. Lovely lake very welcoming im definatley coming back in the future, the food was better than my wife cooks! 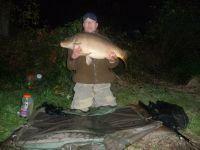 I used my owns baits and the lake special boilies with large pellets. WiFi, Great shower, big bait freezer and fridge perfect. 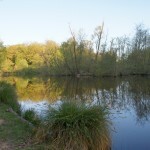 Very nice private lake, it can get very warm as the lake is very well protected by woodland, take sun cream in may! 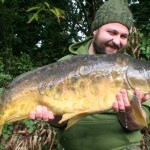 To get fresh rolled quality bait on site is a massive bonus and very helpful owners, Dan even helped me out with a bait formula i had been struggling to roll being a dabbler in rolling my own baits. 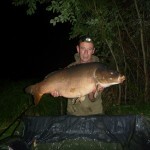 fish from 25lbs to 44lb 16 fish over the week and lost a fair few. 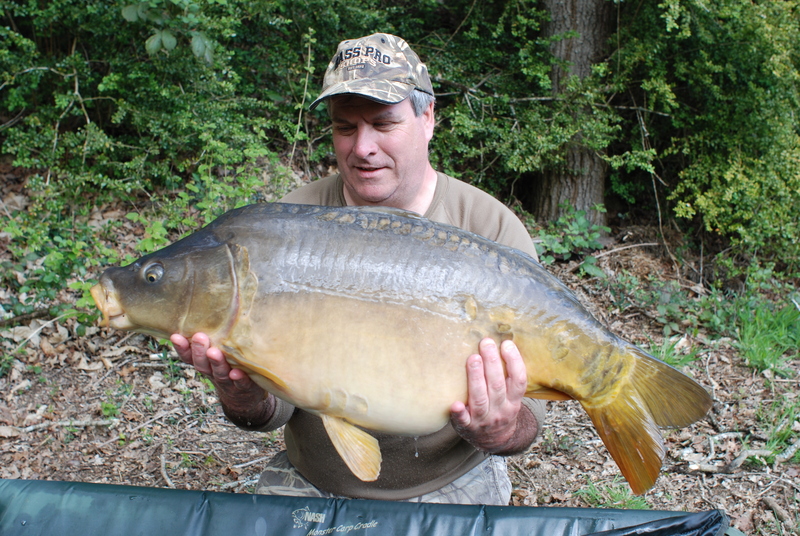 Good lake owner knows his stuff and very helpful stunning old estate lake, well managed, food was great. 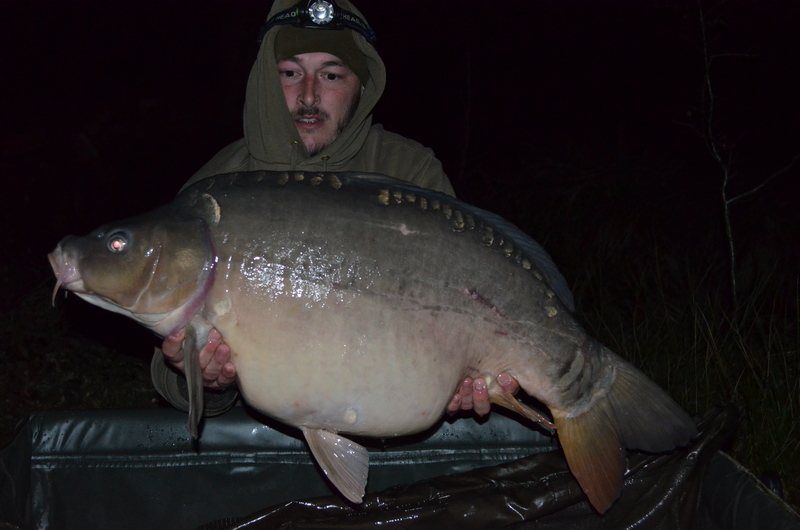 Biggest 46lb 4 oz mirror new PB 3 x 30′s 10 twenties from 27 – 29 lbs 2 x doubles one a fully scaled mirror very nice for the future. Snowman and oakwood boilies plenty of bait be prepare to be mobile. Lovely lake good relaxing break we will be back in future. Food 10/10 !!! we didnt need lunch beautiful fish. 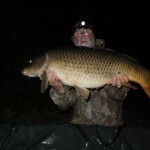 44 mirror PB, 30lb common, 33 mirror, 29lb 8 common, 39lb mirror, 34lb 4oz common, 34lb mirror, 3 x mirrors 28lb and one small one 22lb common. bait heavy we used house bait be mobile. 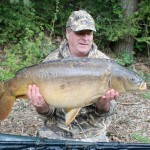 Great Lake, friendly and helpful owners Good Fishery. 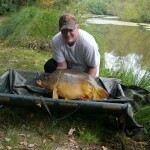 12 fish from high twenties to 47lb 7ox mirror which was my PB. Big beds of house bait we took Cell as well but only had one fish on this so swapped all our rods over which improved the action. great shower clean everything you need. 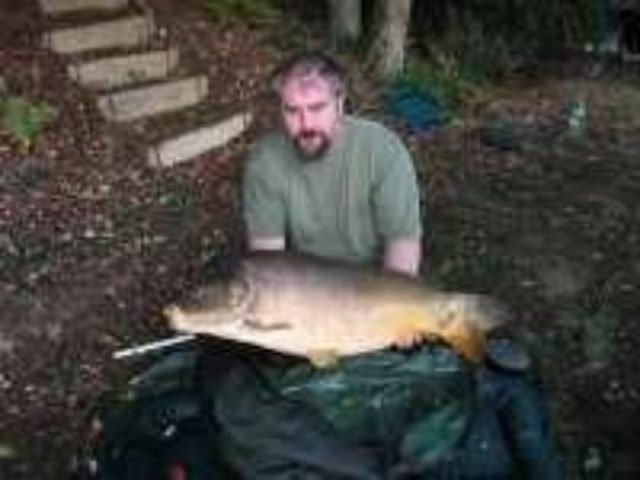 Was still pretty cold to be honest most of the fish in the day, the fish were in excellent condition well kept old lake, food was tremendous had a good week. 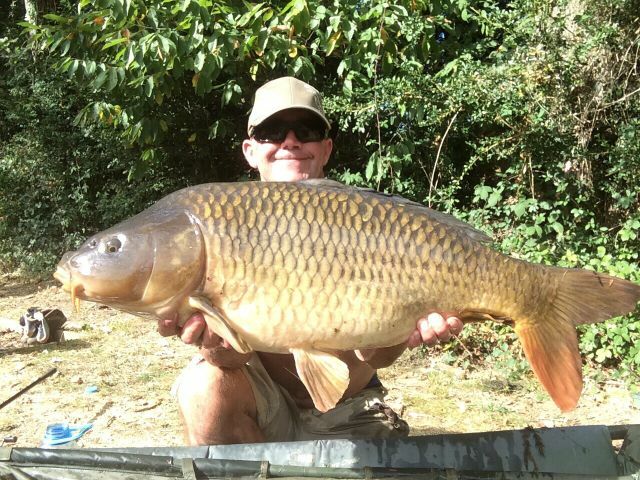 Great lake, great bait service, great fish that are in beautiful condition perfect holiday fishing for us and i broke my PB common and mirror happy days, the food package was also the bollox very nice! Fish seemed to be in a slightly funny mood looking like spawning then not but we still managed 14 fish including a beautiful linear of 34lbs. 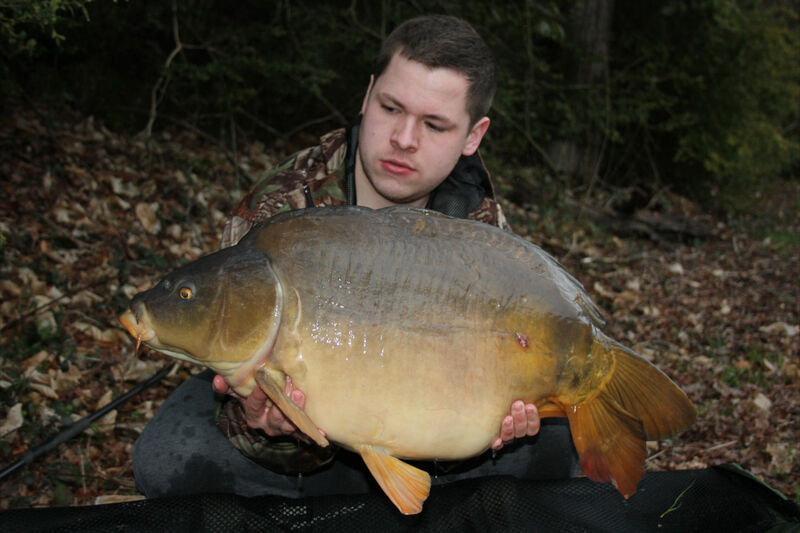 We bought cell they didnt seem to like it so dan rolled us some bait up we moved about and fished both ends as its a long lake of around 350 meters and we upped our baiting midway through the week and caught well late on. Beautiful lake surrounded by forrest very relaxing food was fantastic every day! 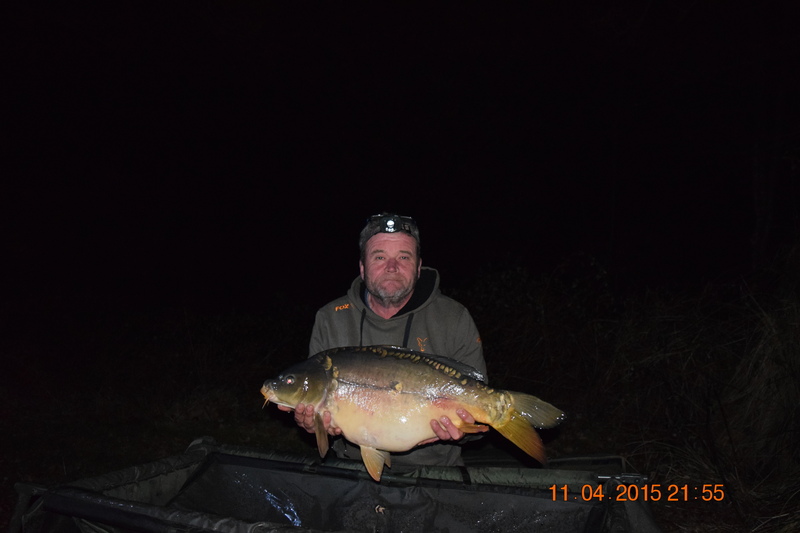 The fishing was a bit slow at night but hectic in the day maybe down to the cold night time temps. It was extremely hot every day and the fishing was fairly hard for us but we did manage to get a few out, very scenic visit near by beaches as it was a family holiday. 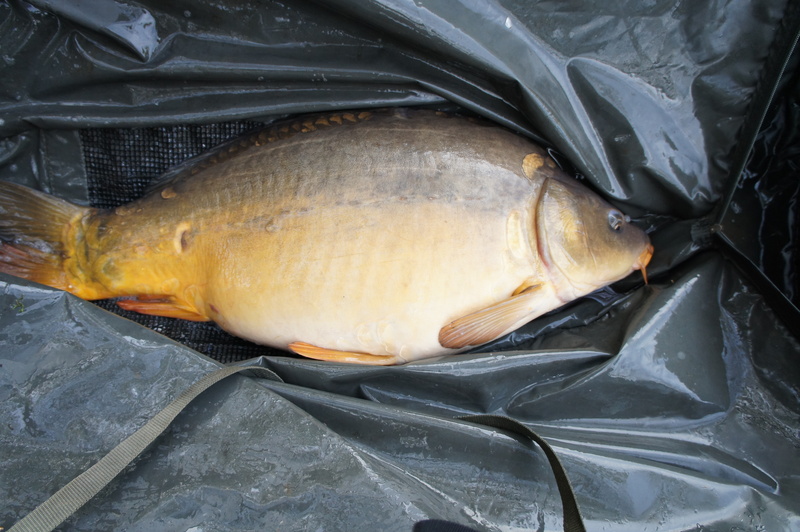 We used loads of house bait got through about 60 kg boilies we were baiting two different areas of the lake and resting the swims. Lovely place, welcoming hosts and very peaceful. 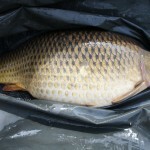 Fishing was great Food package is a must, brilliant. 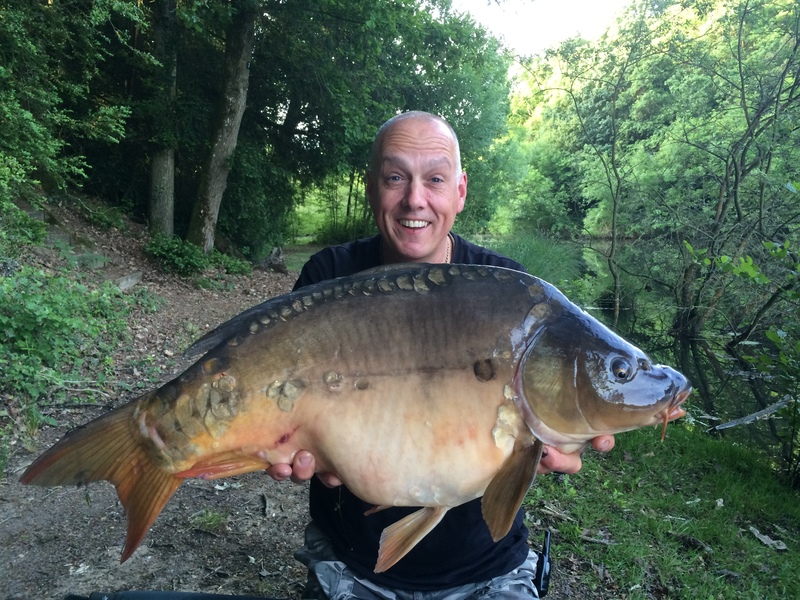 Nice 5 days fishing while on a longer vacation in France very scenic spot in woodland, mouths all in perfect condition some stunning dark commons, food was equally as good. 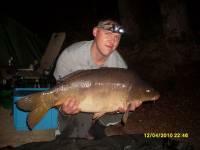 Far margin fishing with lake special and our own bait. Everything you need including a fridge for this year a good new addition for the beers! Coming back for our third trip. Dans very helpful and Cheryl great cook. Always have the food loads of it and nice, fishing was great. 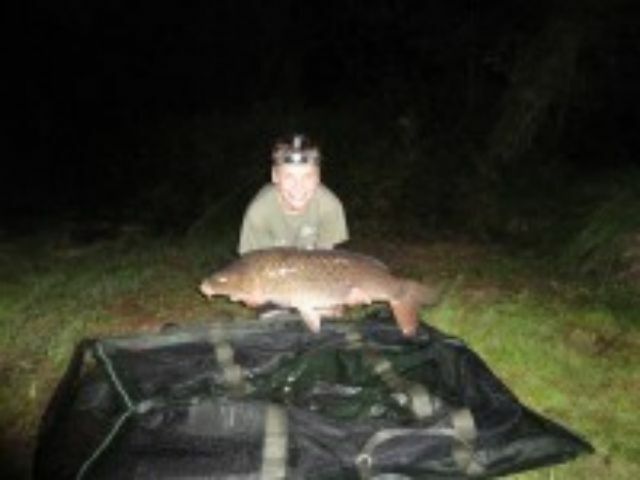 Lake Special and Tom found stalking them on the surface was a good tactic. 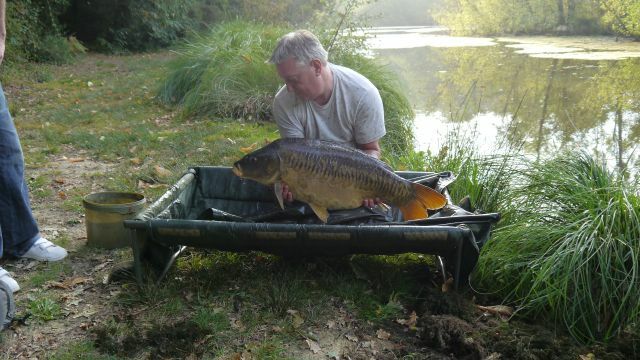 Pretty Fish, we had a linear and fully scaled mirrors, nice looking old mature lake with south facing swims. Good owners and we had the breakfast which is a must. 11 x 20′s to just under 30lbs mainly mid to high. A big thankyou to yourself & Cheryl for looking after us agin this year…the chicken pie is still a firm favorite mate ! As ever the lake ,fishing and condition of the fish was fantastic although I think our session coinsided with the fish just about to start spawning so was a little harder than expected but equally as rewarding once we got a few on the bank ! I really appreciate you taking the time to pass on your lake knowlede to Bradley and that “top secret rig” which I think he may of perfected himself now looking forward to coming back next year and hopefully back amongst the 40′s again like last time with my brace. 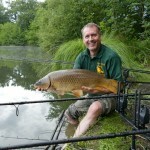 Beautiful lake, helpful advice on arrival, food was great and above all the fish are in great condition. 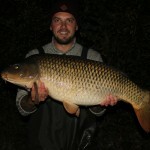 Everyone had carp over 30lb with a new PB Common for Ryan at 32 lb Biggest fish 37lb Mirror stunner, the smallest fish 21lb common action straight away. 11 other 20′s mainly mid to high twenties. The week started with my rod being dragged in on the first night. Lucky took the boat out on the Sunday morning and managed to retrieve it. 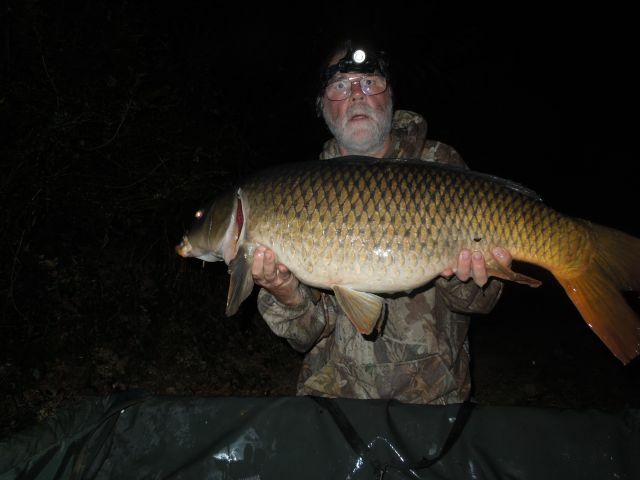 It was a bit of a strange week we only banked carp up to 26lbs its the first time we have visited and not caught carp over 30lbs. 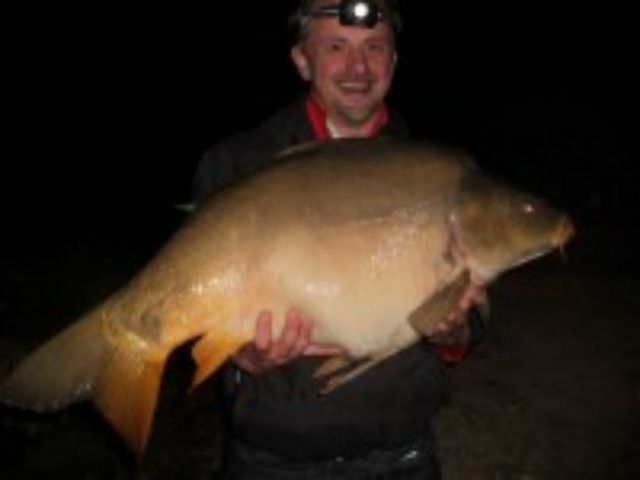 We did loose a fair number of big fish due to hook failure this is the strange part! We experienced hooks snapping and bending straight. (these were big brand hooks nash and korda) Not too sure what was going on as I use these hooks at home and have had no problem. 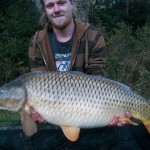 We suffered 4 losses due to this on decent fish. They were fighting particularly hard with the colder water temps but still you don’t expect this. 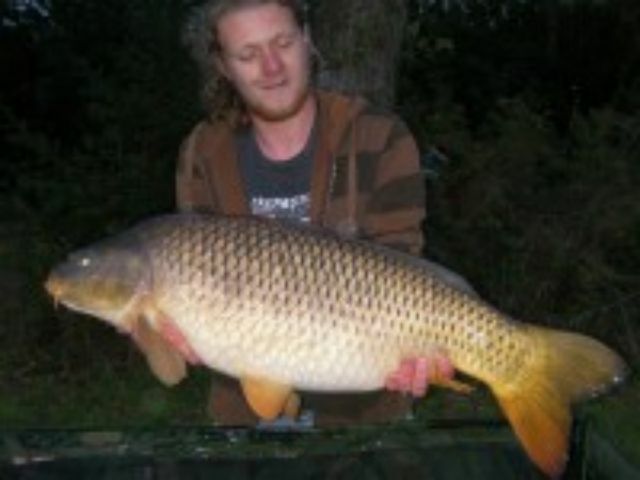 One mid twenty common that was banked had also straighten another hook and we were lucky to land it. 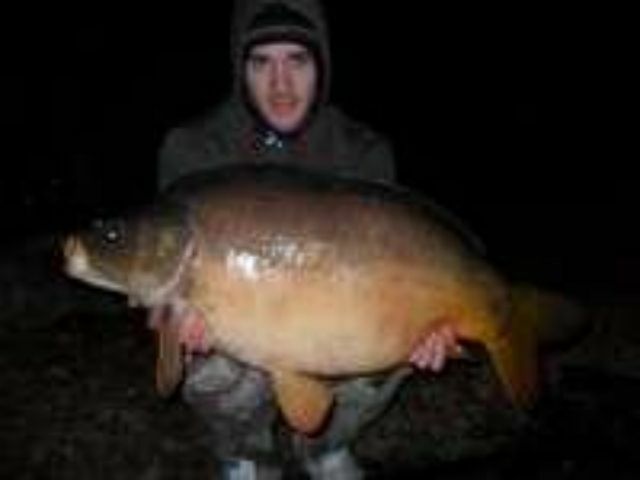 Had a few stunners though including some big plated mirrors and an offspring from the perfect linear at just over 20lbs. 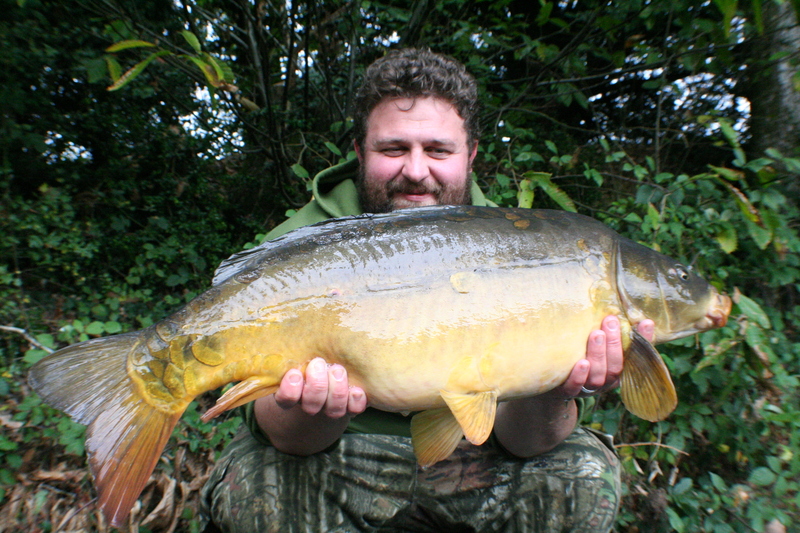 we have caught the perfect linear before and this little one is almost an exact replica stunning. Be back in April as my quest for the Black common goes on! 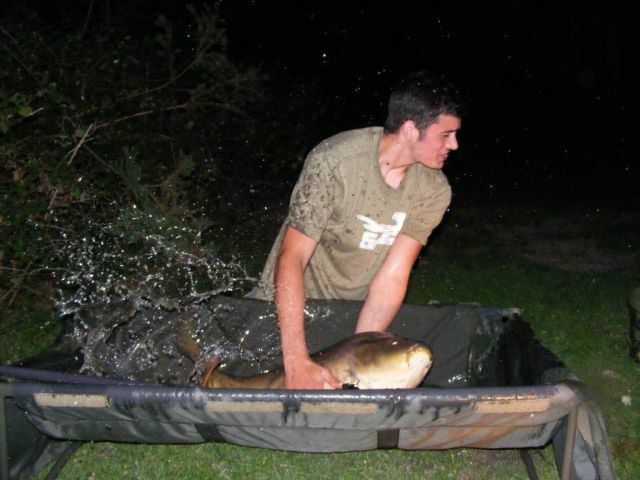 Beds of boilies fishing to the features. 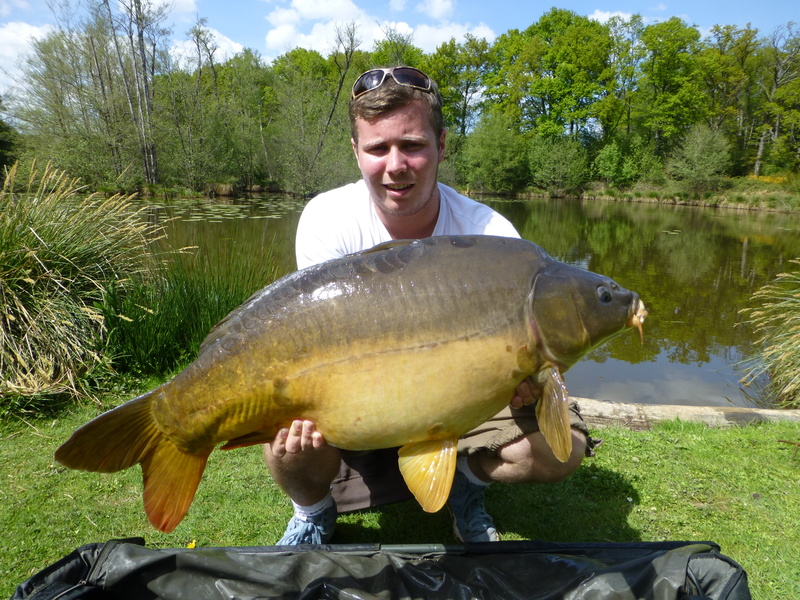 Great week as ever, food/facilities top notch, the fish are in awesome condition and some of the prettiest i’ve seen. 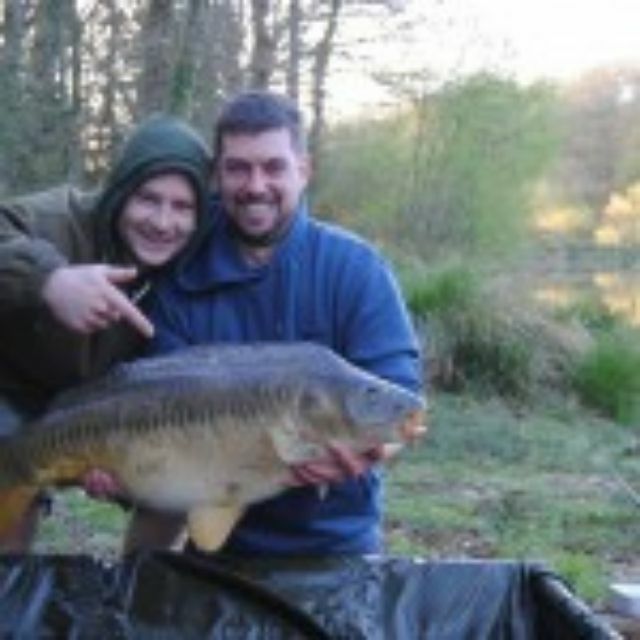 2 of us broke our PB’s myself with a 31lb mirror and my brother with a lump caught off the surface at 46lb 4 oz, which was a new record at Oakwood for a surface caught fish. 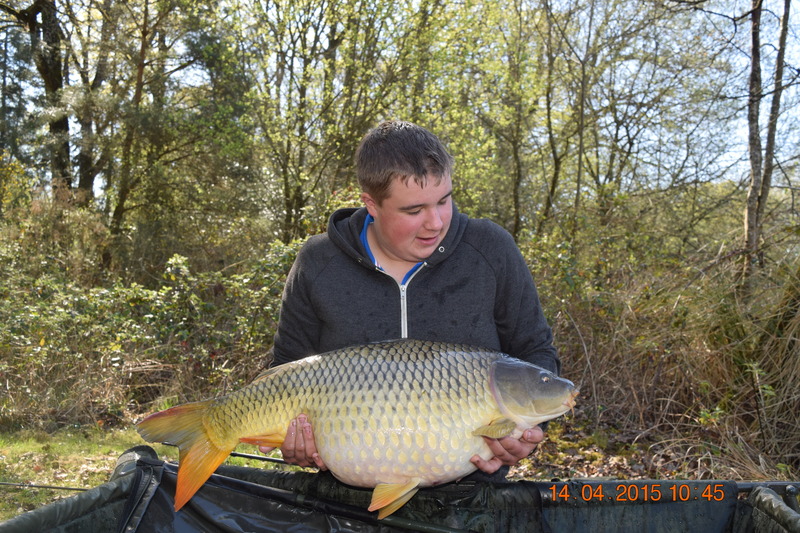 The other fish we caught ranged from 16lb – 33 lb with most being mid to high twenties. longer hooklinks single boilie tipped with corn and snowman rigs fished over a bed of lake special boilies and surface fishing. yes good facilities and a decent shower. 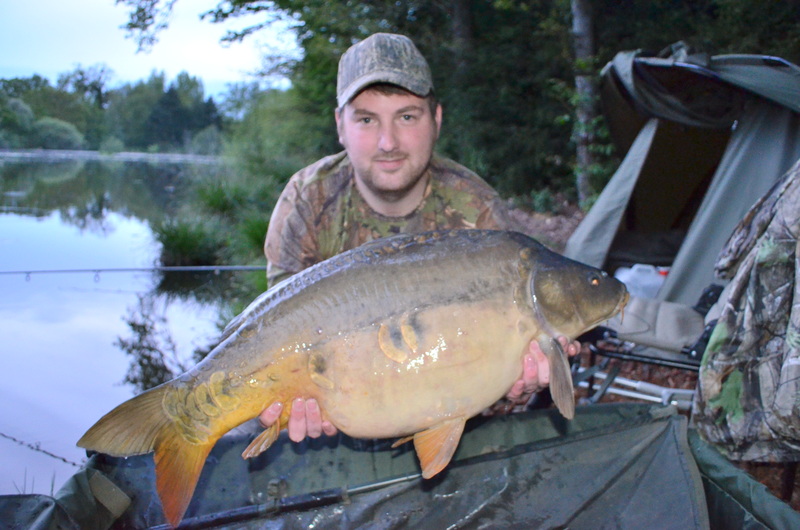 The Surroundings and the lake are stunning plenty of large carp to go for. 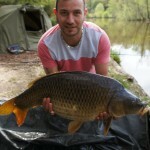 Well run site with fish safety at the forefront which is evident from the condition of the carp.. Helpful information from Dan who is always willing to help. Can’t wait to come back next april. Thank you to you and your good lady for an enjoyable weeks fishing and great food. I had 22 fish up to 38lbs a great weeks fishing and lost a fair few. 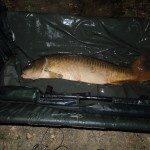 Rest the swim whenever possible, plenty of bait (35kg boilies used) lake special. listen to Dan I took his advice from day 1, he knows his lake and how to catch the fish. I’d like to take this opportunity to thank Dan & Cheryl for their warm hospitality throughout the week I spent at Oakwood fisheries . I was immediately made to feel welcome and Dan was really helpful in tactics and bait to use . I soon had my first capture from one of the spots Dan had pointed out . 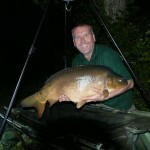 I went on to capture a total of 22 fish up to 38lb with an additional six fish lost . 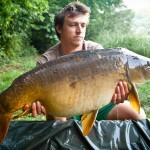 The fish are stunning , in excellent condition and fight hard so be prepared ! 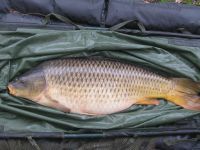 … Dan also supplies fresh quality bait at a very reasonable price ( I used it to great effect )… The facilities were excellent and very clean … Cheryl’s cooking was fabulous ! 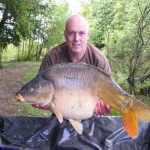 Highly recommended ( I guarantee you will not go hungry ) The lake is very picturesque with some great features to fish to , the pegs have plenty of room and are easily accessible . In summing up I had a fantastic week , the fishing exceeded all my expectations and more ! … I will definitely be back in the future , my tip for catching !.. 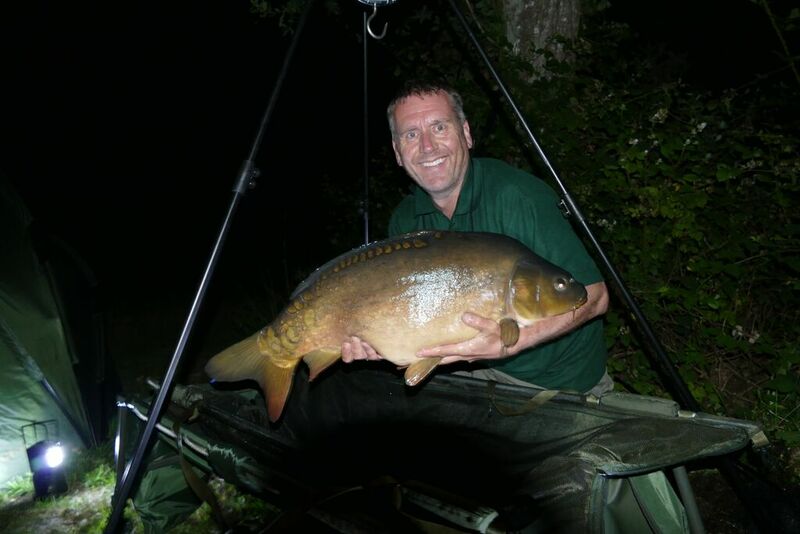 Listen to Dan’s advice he knows his lake , his fish and how to catch them ! Thanks for everything …. Kind regards , Ciaron Jordan . Beautiful lake, Fish in perfect condition and good food and plenty of it. 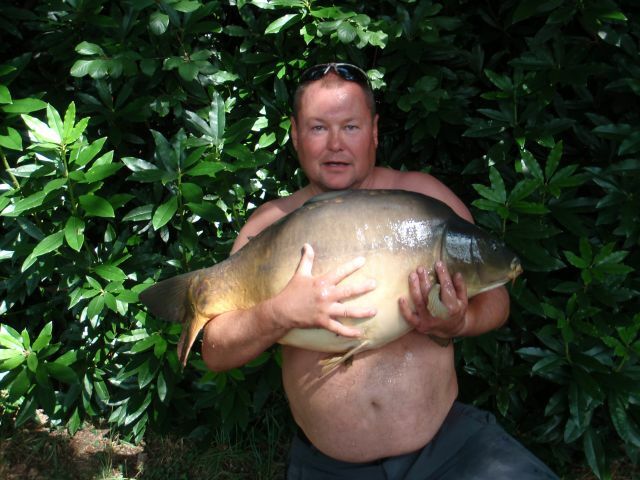 Accurate bait placement Kd rig and lake special boilies find your spot and stick with it. 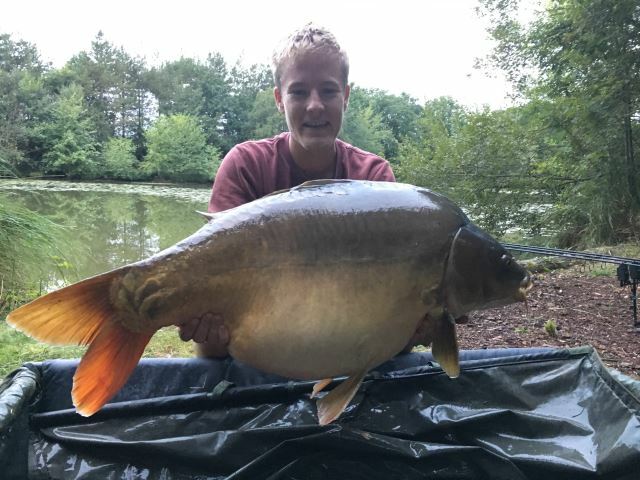 we had 18 fish between us mainly between 25 – 35 lbs, Pick of the fish were a perfect zip linear at 33lbs and a great proportioned mirror of 46lb 10 which was a new PB for me. We had a great holiday very helpful hosts listen to dans advice. very beautiful lake with mature woodland surrounding it. Will be back in the future. 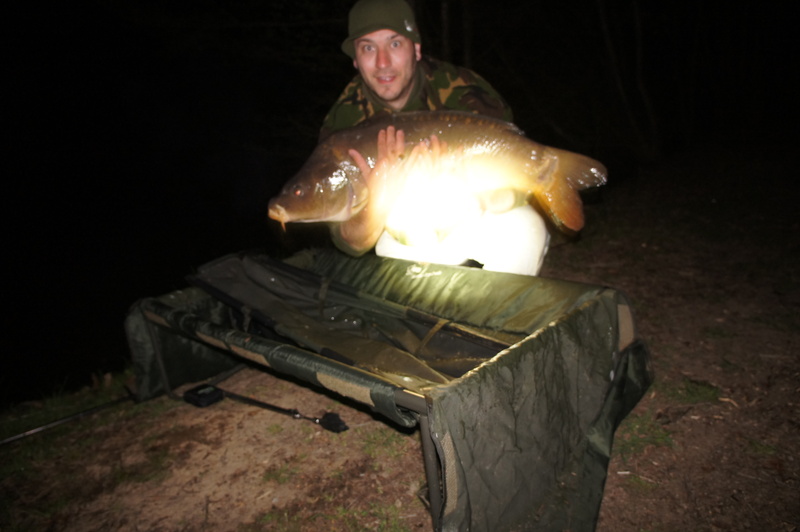 3 x 30′s to 39lb 6oz 8 x 20′s to 29lb 10oz 2 doubles and lost 7 fish. 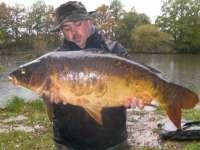 bottom baits tipped with small pop ups tight to the lily’s. 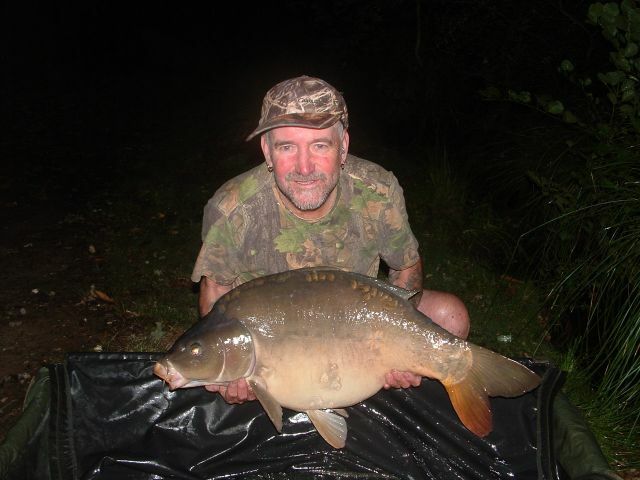 Lake special boilie worked the best by far I ended up leaving my cell boilies in the freezer to take home as they didn’t really like them and ordered some more lake special which was rolled fresh, great service and got to see the boilie machine in operation. Yes the food was lovely just like last time I was here, I would recommend it to everyone visiting. Facilities were perfect and the shower is great! Great trip overall . Caught far more than I expected and Dan and Cheryl were excellent hosts who did everything to make sure I was happy. 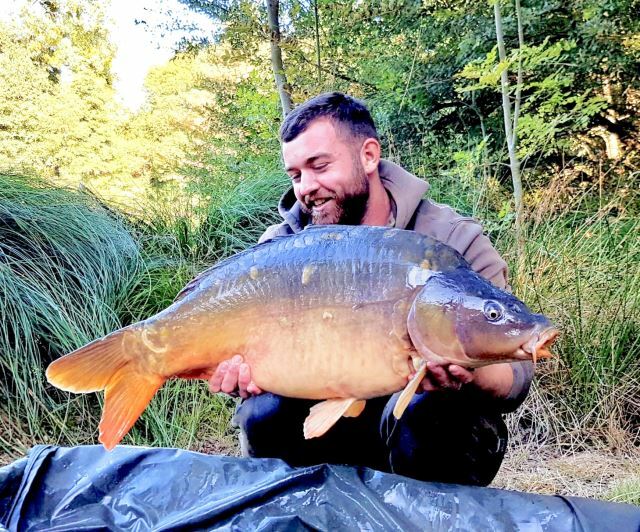 The lake is stunning this is my 2nd trip here and I was delighted to catch one of the linear’s at 32lb 2oz without doubt the best looking fish I have ever caught! 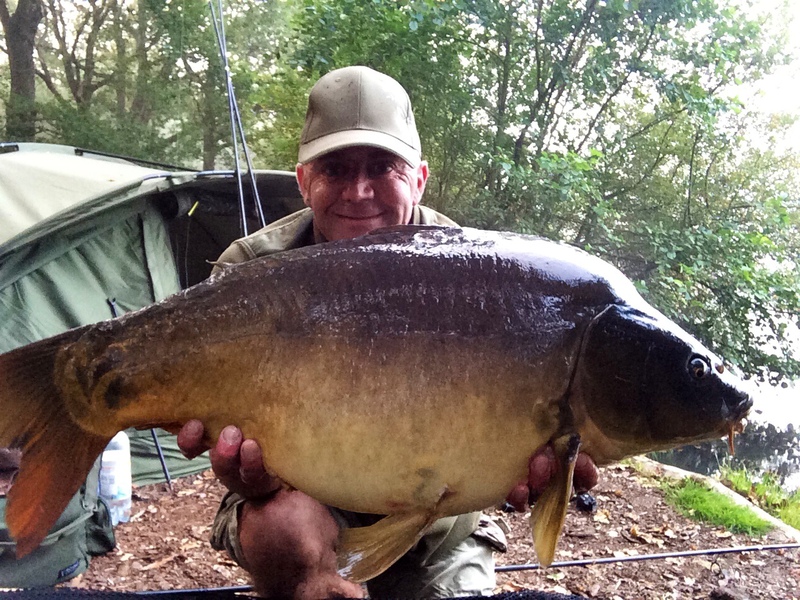 A brace of 40lb mirrors, 4 x 30′s between 31lb 8 oz and 38lb 4oz, 6 x 20′s mostly high twenties and one double. Great venue run by Dan who really cares for the fish which are in mint condition. Food was excellent every night gained a few pounds! 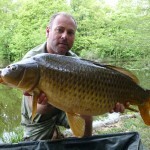 Lake is a stunning estate lake, I rented the whole lake for 2 which I thought was very good value. We will be coming back soon. Dan was a great host full of information on where to drop our rigs listen to him and your catch more. 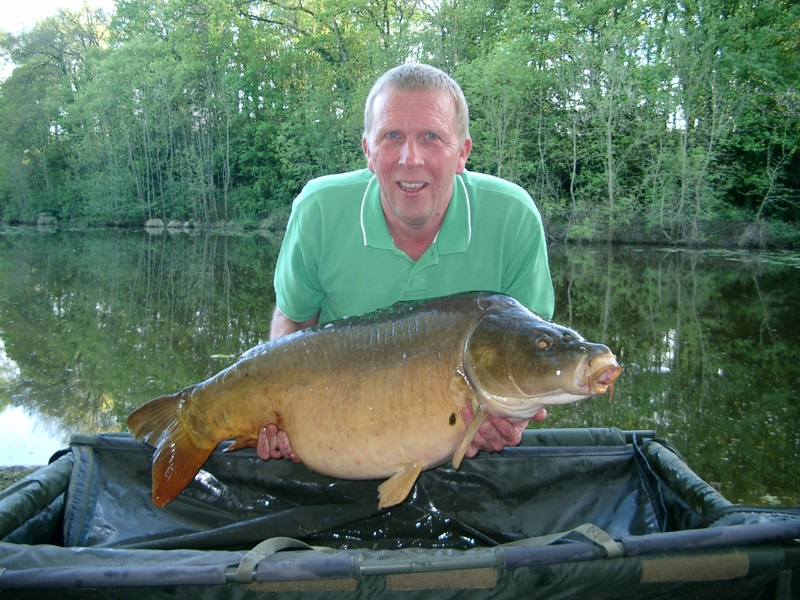 stunning lake and fish above all in great condition, we will be back again. Carp between 18 – 39lb 10 oz Mirrors, commons and a beautiful linear. Very helpful hosts, struggled a bit at first then dan came down to offer some advice on the spots I should be fishing and even baited the swim! 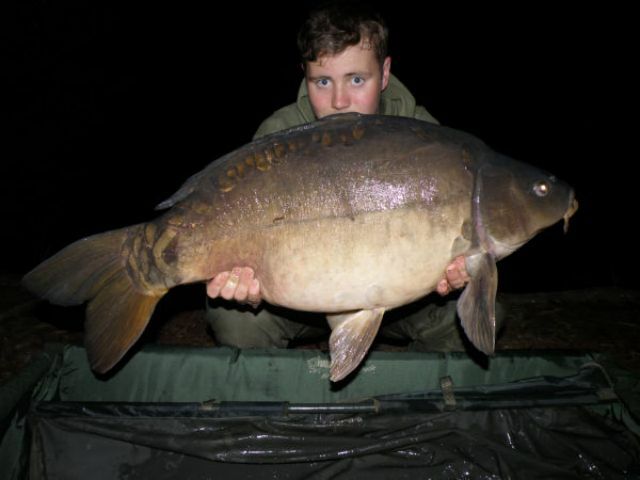 I was then on the fish and ended up with several thirties and broke my PB with this stunning mirror of almost 40lbs. 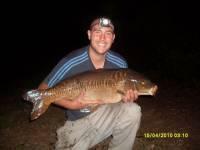 All fish caught were in great condition. 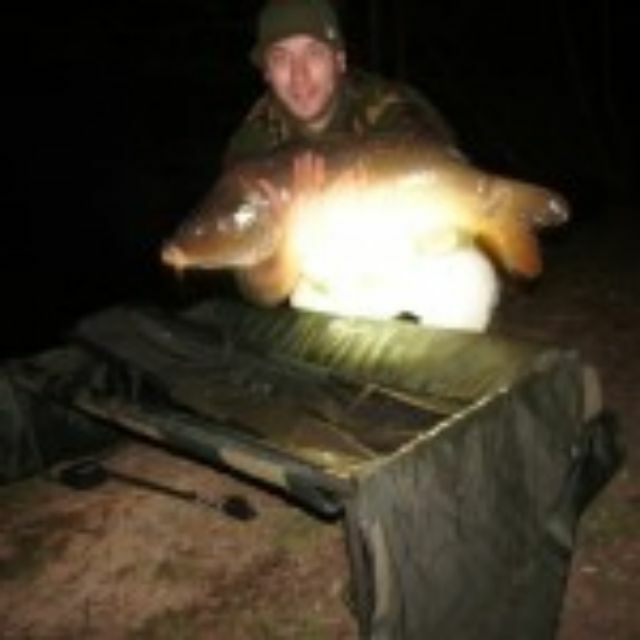 Bottom baits or snowmen, couldn’t get a bit on a pop up on its own. 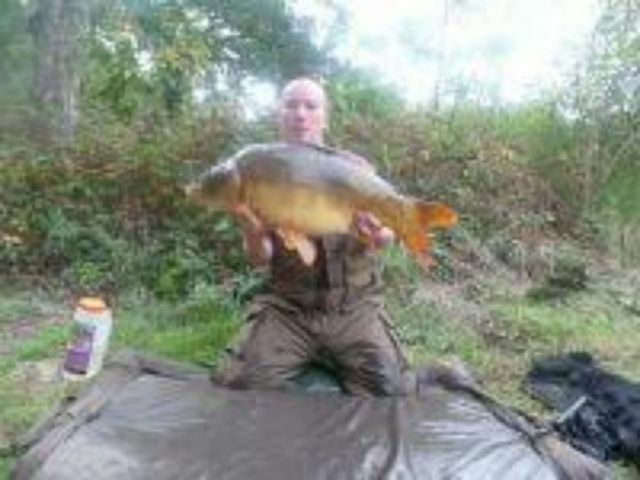 We used matrix twist rolled by the owners on site great service fresh bait! Superb and the food is amazing. 3 day trip, weather was changeable had some stunning looking carp, beautiful estate type lake cracking food. 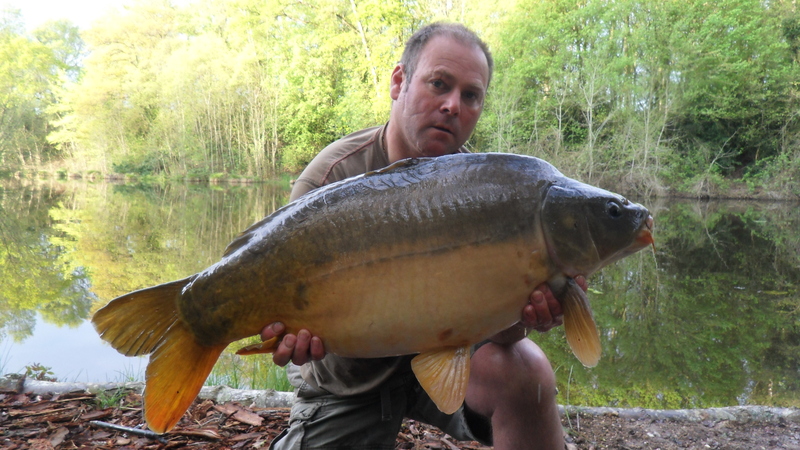 12 carp between 20 – 36lb 8oz highlighted by the biggest being a zip linear also commons mirrors and one fully scaled. 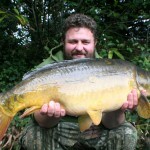 Listen to the advice given by Dan and get on the Trix, bait rolled in house by Dan great food source. I had a great week away from work, I saw deer, red squirrels, water voles, big birds of prey and had some stunning fish in a beautiful setting all in great condition… happy days. 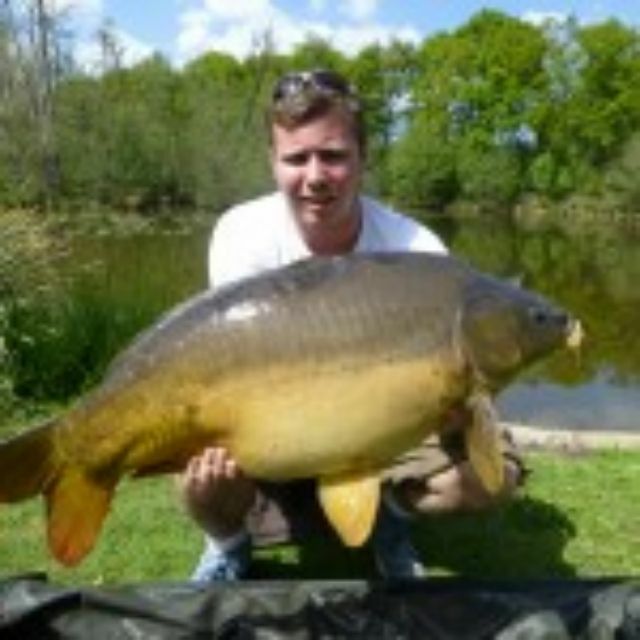 My 3rd year on the trot, great holiday, great fishing stunning fishery and a new PB. The food really adds to the trip aswell its a must! A great relaxing week in a lovely setting, Superb food Cheryl is a great cook,friendly couple cheers to Dan and Cheryl. 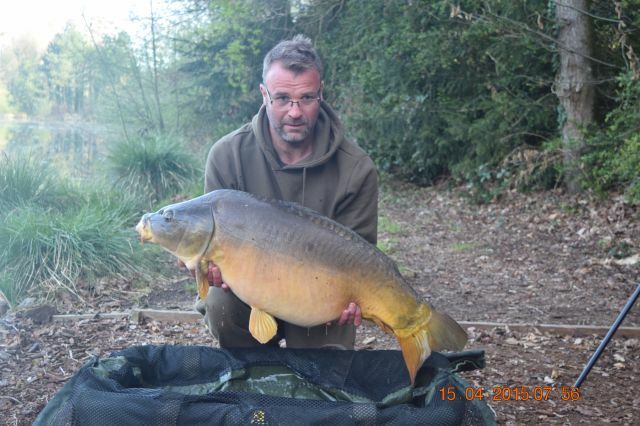 Lovely mature lake with good wildlife. Comfortable big swims well managed lake. Beds of boilies, bottom baits tipped with corn. Very amazing food well worth every euro! Very good combined with very tasty food and big portions and bait rolling on site what more could you want! Lovely lake, beautiful fish and very friendly helpful hosts. 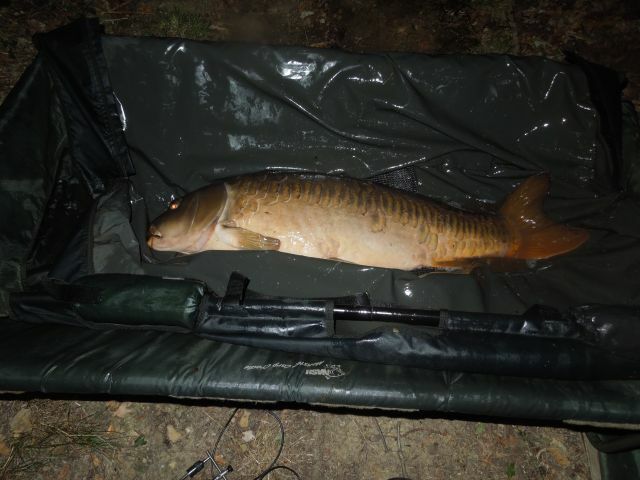 16 carp from 18 – 44 lbs very pretty fish and in great condition one of my favourites was a mint long linear of just over 30 one of the best fish I have ever caught. Plenty of bait with snowmen style presentation. I used matrix twist rolled fresh on site. 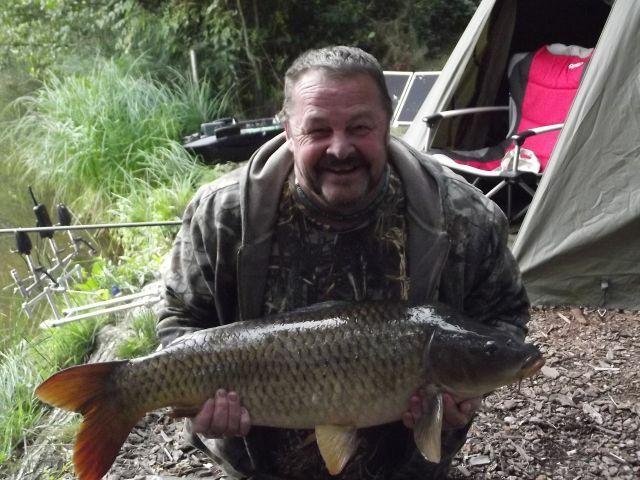 Above what I expected from a carp fishery, very clean awesome shower and great food all hand made. A lot better than most restaurants I have ate in on the side of a lake perfect! carp up to 29lbs new Pb and just missed the ladies Oakwood record by 2 lbs! Yes very nice, excellent shower and no generators here all mains electricity for charging bait boats all very clean and tidy. 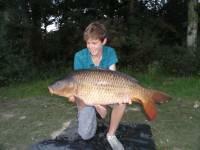 Very beautiful well kept lake with excellent wood chipped swims nestled in a secluded valley. Nice surrounding area too where we enjoyed some days and evenings out. 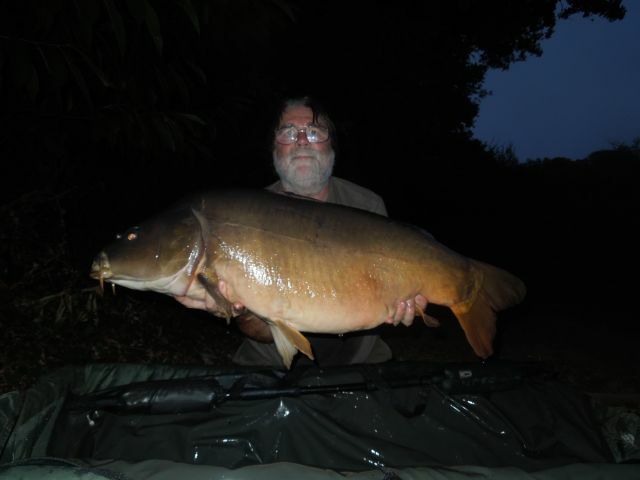 Carp from low twenties to 41lb including a stunning thirty pound linear. Kd rig with 18mm K – G – 1 or snowmen rolled fresh on site. Very beautiful lake lots of features and wildlife. Brilliant factilities much better than I expected and the food was really good every night well recommended. This is my 16th year visiting France and this is probably the most beautiful lake I have visited with great wildlife all around in the mature forest. 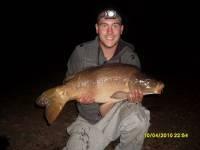 Well run fishery with nice hosts and contains some stunning fish all that we caught were in great condition. I will return again one year. Lovely lake great spot and after a hard start to the week the fishing picked up after spawning and smashed my PB by over 17lbs! would definitely come again. 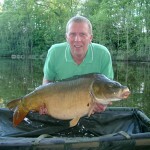 Nice Place Stunning Fish in great condition, lovely owners very helpful. 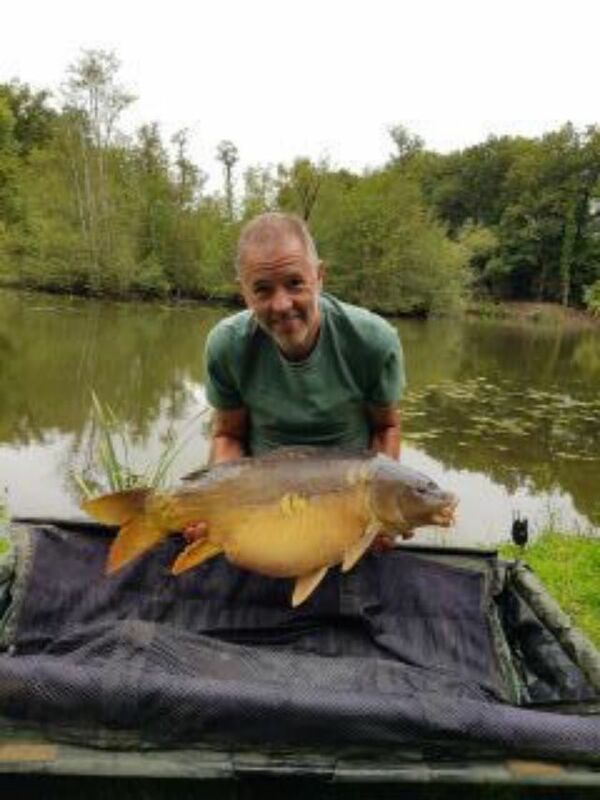 Stunning estate lake packed full of features and cracking fish in good condition, food was absolutly great every night dont cook urself unless your a top chef no need fab! 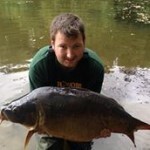 Really enjoyed stay, stunning place good fishing and excellent food with plenty of it, i smashed my pb by over 20lbs! 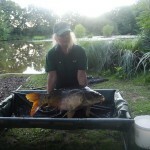 Lovely lake, loveley fish, food was great every night – thank you for helping feed two fishermen who normally live on tins! Beautiful site, abundance of wild life and nice comfortable swims. 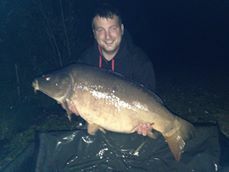 Best fish 2 mirrors of 40lb 1oz and 37lb 4 oz but a difficult week compared to all our visits before. 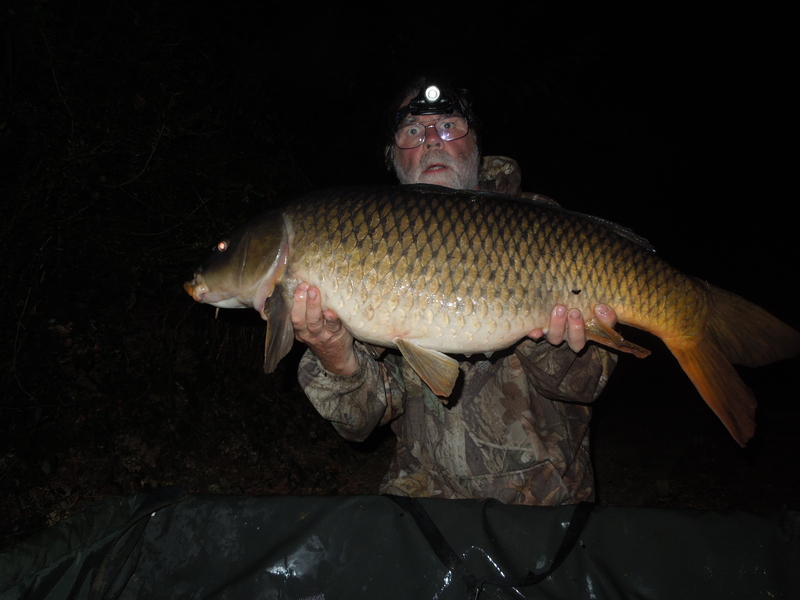 As the conditions were cold we decided to bring some maggots fished in pva bags with matrix boilies which were rolled on site. The fish came from a silty area. yes very good, the covered seated area came in handy this week, food great as always nice and clean. My 4th trip here lovely place as always, food top notch, great trip away for 4 days despite some of the weather! 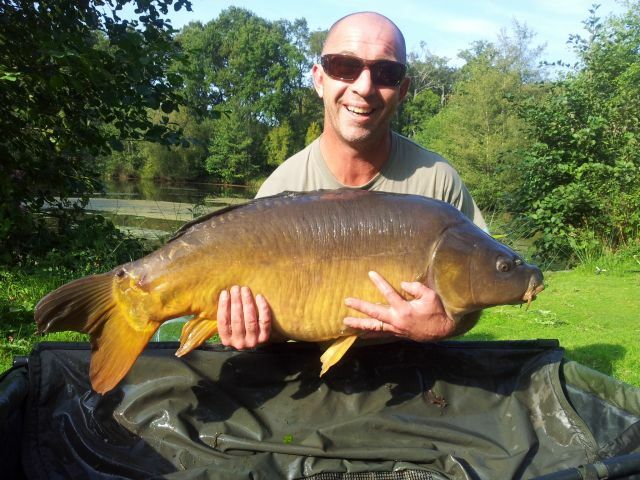 Lovely swims, beautiful old lake, well run fishery. Could drop off the fishing tackle in the swims which made life easy for my bad leg. Food great and dan very helpful. 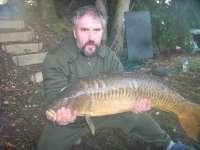 All fish caught on boilies both pop ups and bottom baits. Used Matrix rolled on site at oakwood. very nice clean and tidy as always and awesome food. well reccommended. 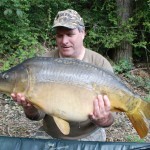 Beautiful lake, stunning surroundings, friendly hosts and plenty of near by shops. 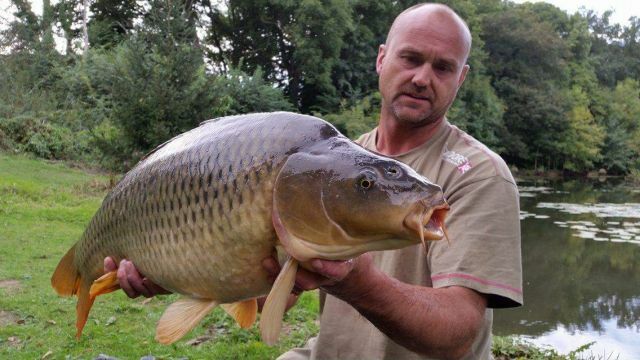 Plenty of boilies bait purchased on site and rolled fresh. 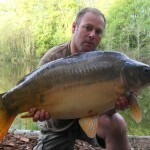 Fantastic place, great fish, really beautiful woodland setting with comfortable wood barked swims. Put my back out holding the 1st forty so lucky dan was at hand to hold the second one up for me! Fantastic venue this is my 2nd trip, lovely fish dan is willing to help whatever is needed will be back again! 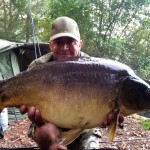 Boilies bought on site with some of oakwood colourful pop ups. 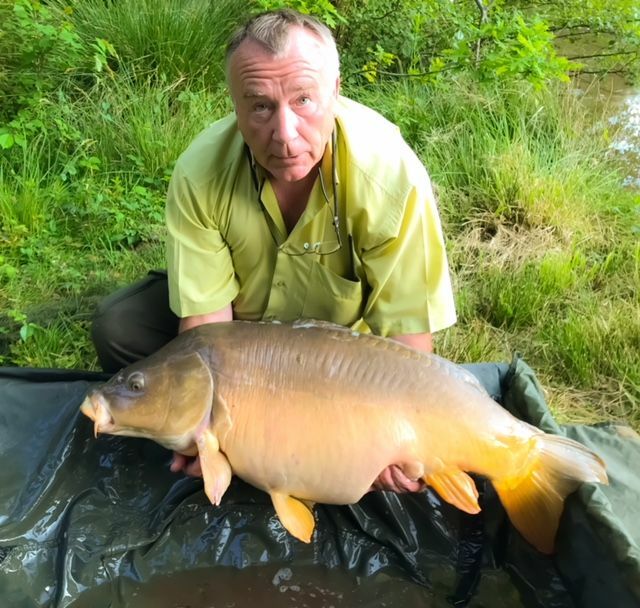 We had a very enjoyable trip, we find dan & cheryl very accommodating and helpful and the lake was very picturesque, with excellent pegs, great facilities, fantastic to have the lake to ourselves without any hassle from other anglers. We both thought the home cooked food was excellent and there was a ready supply of good quality bait on site. Thanks for your help with organising the trip. 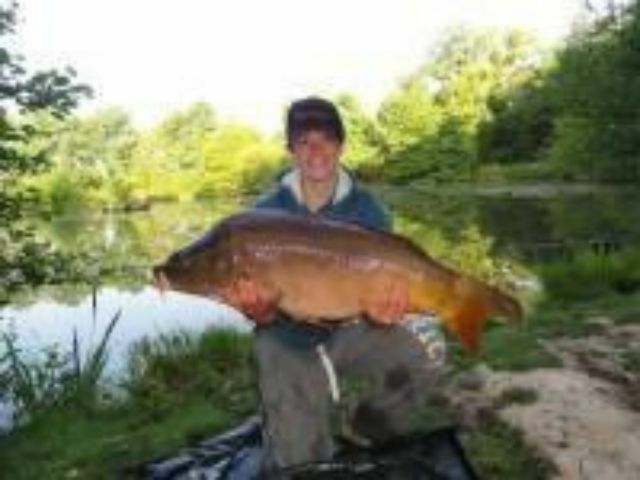 the carp cradels were brilliant im buying oone when i get home! and the food was great big portions. Stunning lake with many features. 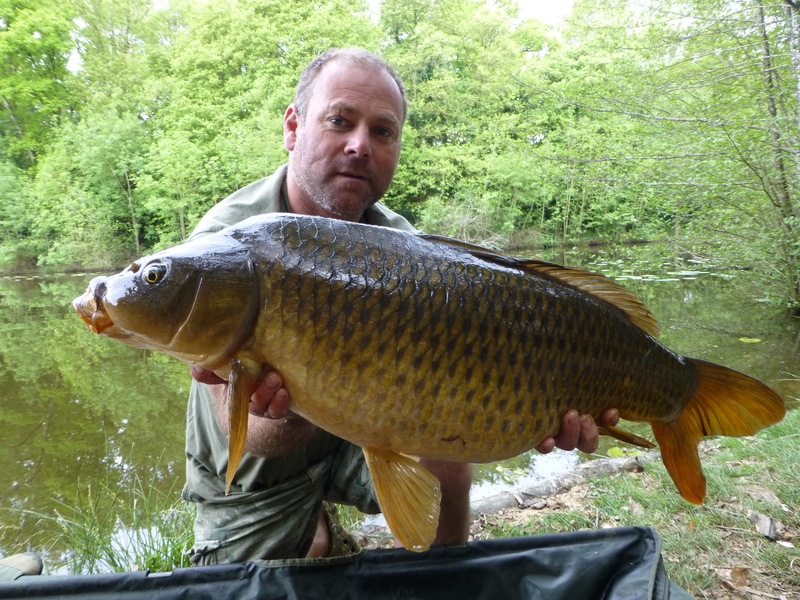 The weather was very changable caught all our fish after the rain had stopped when they started showing again. To have the food package was the best decision i made. 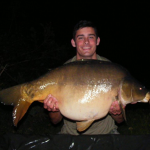 The quality of the bait available to purchase is also excellent and dan is very happy to share his knowlwdge of the lake to help improve your catch. 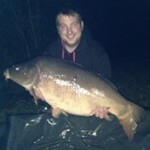 We both broke our pb’s and rob broke his by 21 lbs! I would definatly recommend the venue and would be happy to return. As always a beautiful place to fish it was a bit colder than when I normally come and it was nice to see the lake looking different in her winter colours, despite the cooler temps I still managed to winkle some out showing me their lovely winter colours well worth the effort. 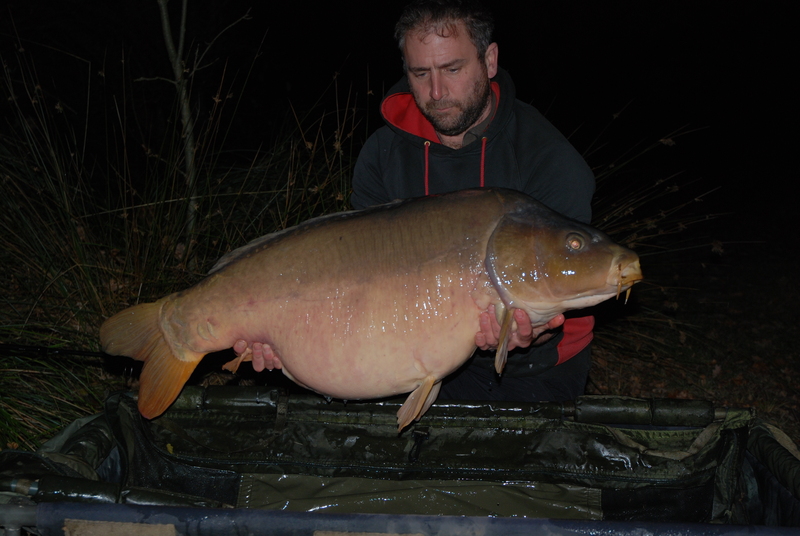 I smashed my personal best by 10lbs thanks to a stunning mirror of 39lbs and dave added 6lbs to his p.b. 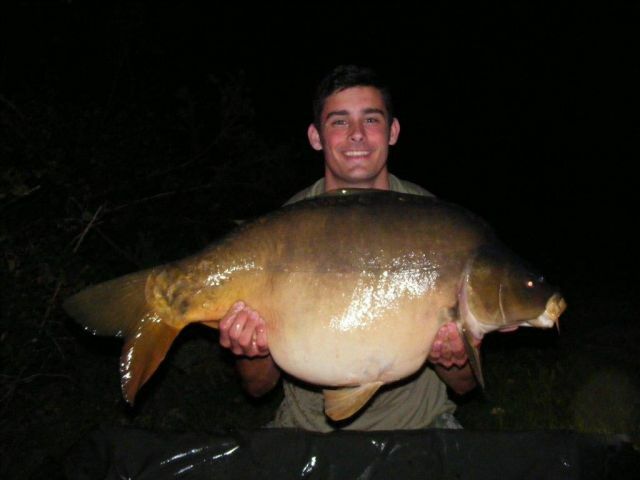 With a 29lb 6oz mirror. 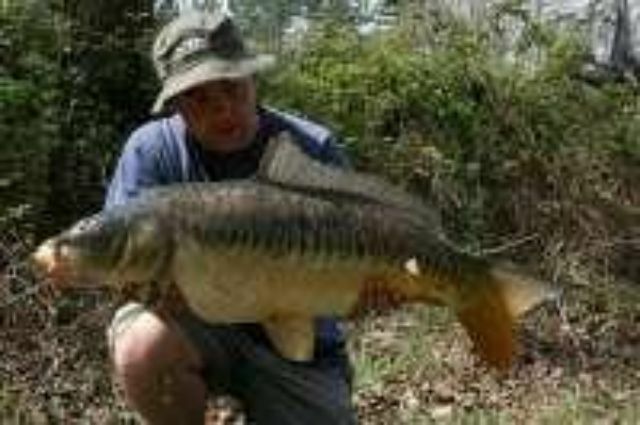 He also had 5 other high twenties including the nicest fish I have ever caught called the perfect linear at nearly 29lbs. 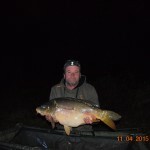 .I fished to gravel areas with short hook links and large 20mm boilies with plenty of freebies. Yes everything we need and plenty of space to store bait. 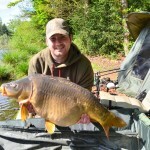 A very friendly and well run fishery. 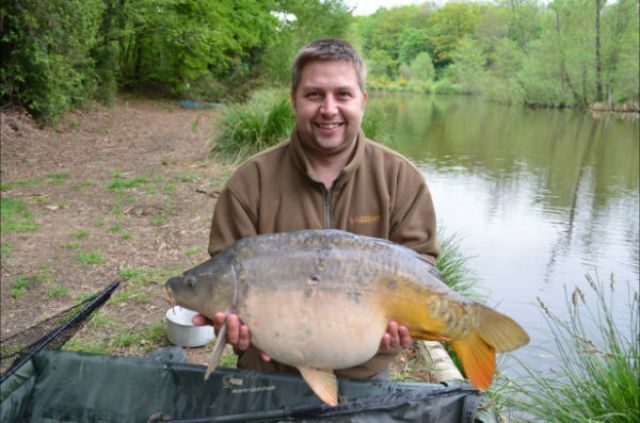 Lovely looking lake and great condition fish and some right stunners! Dan is a great help and always willing to point you in the right direction. Will plan to come again next year. 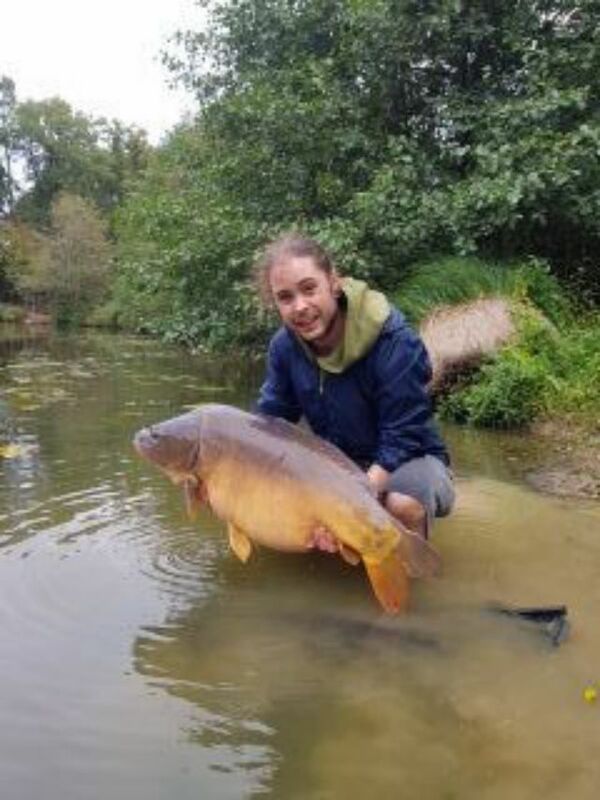 This venue has the potentially to be an extremely good venue, the fish were in cracking condition and large framed, so can well grow considerably bigger. Dan & Cheryl are both great people, happy to help. Worth trying Cheryl’s home cooking as well! I broke my pb twice so I can’t say more than that. 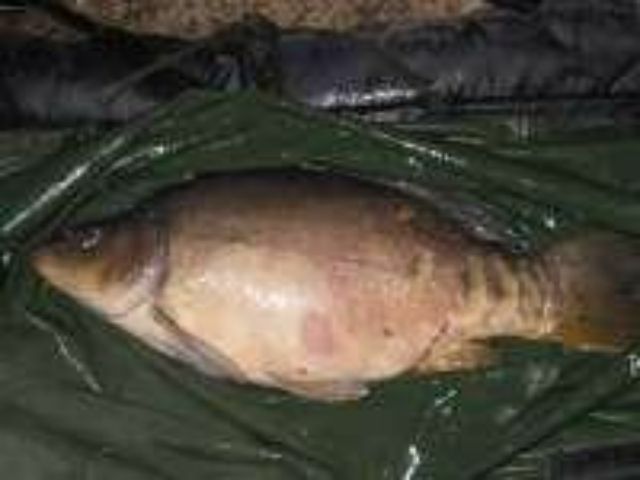 31 lb mirror first followed by another at just under 35lb had other mirrors ranging between 25-30 lb and a small common of 18 lb. Totally enjoyed my trip. It was my first trip to France and would definitely come back. Food was great an all-round pleasure to fish well recommended. 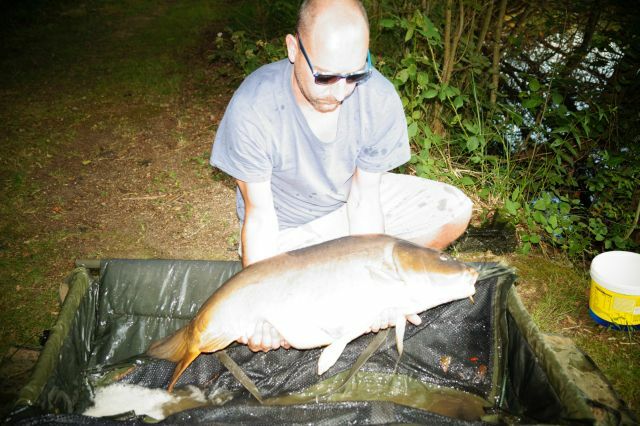 Bottom baits fishing on the gravel and in the silt. We used mainline bolies and fish to lily pads, weed beds and far margins. A great holiday was had by all, beautiful lake, stunning fish and great hosts, we just needed a few more days! Didn’t catch as much as expected due to the very hot weather for 5 days, after the rain the fishing got much better and there were lots of fish moving. Excellent food and good hosts. 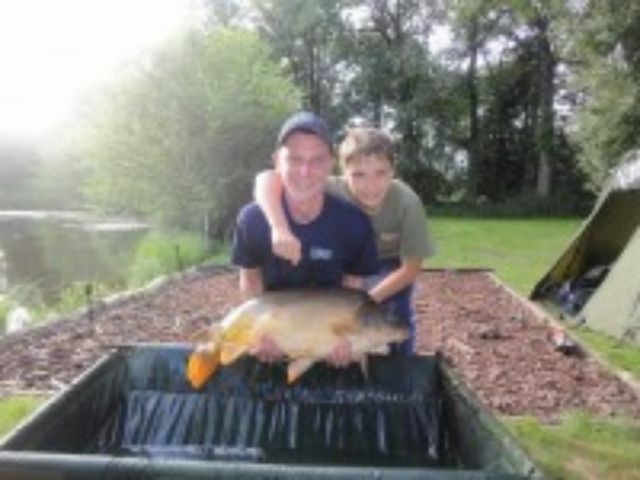 Very good fishing, we both broke our pb’s and my 14 year old son landed a 32lb mirror. Dan was a very good host and Cheryl’s home cooking was excellent and plenty of it! A well run and looked after fishery can’t wait to come back next year! 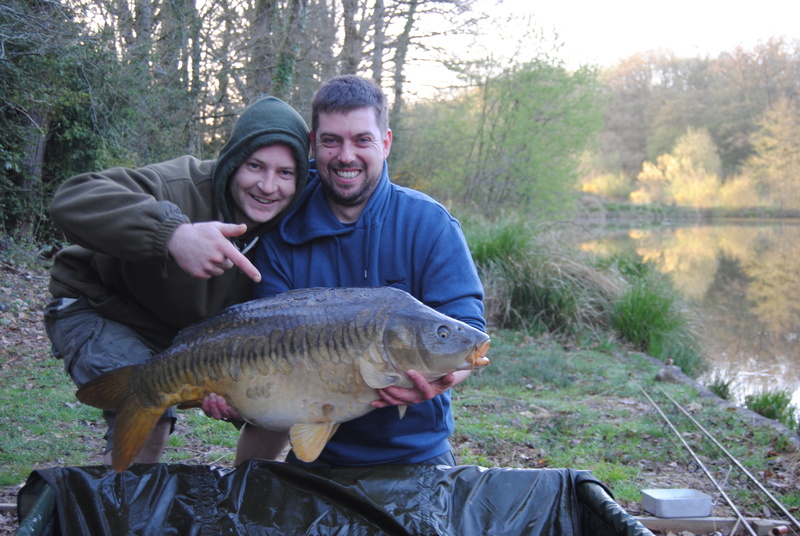 Three of us broke our pb’s during the week, we had carp from 18 – 34lbs including a stunning 28lb linear. Happy with everything, we will be back for a re-visit next year. Wish we had the food will do next time. A beautiful, peaceful venue with great hosts and facilities. 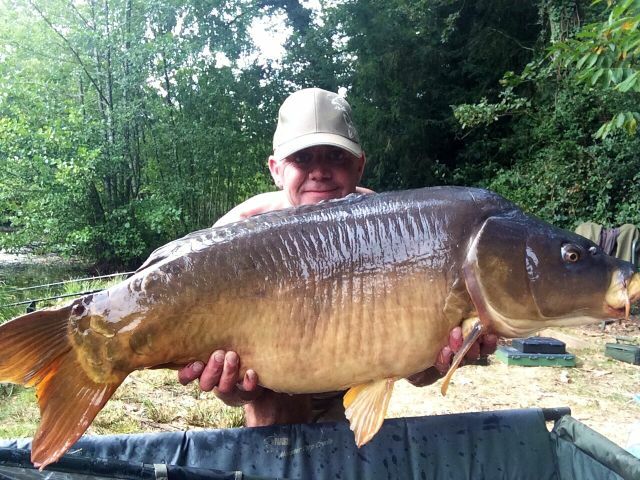 Stunning fish particularly the linears. 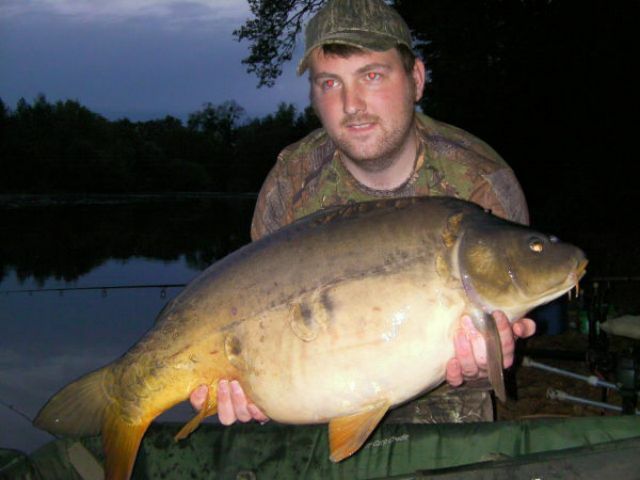 Fish were caught on both bottom baits and snowmen. 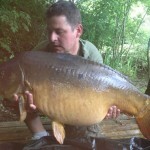 All on boilies. This is a very pretty lake, and surrounded with great wildlife, red squirrels, kites, dear – truly stunning. Really enjoyed the week, nice and secluded in stunning surroundings. 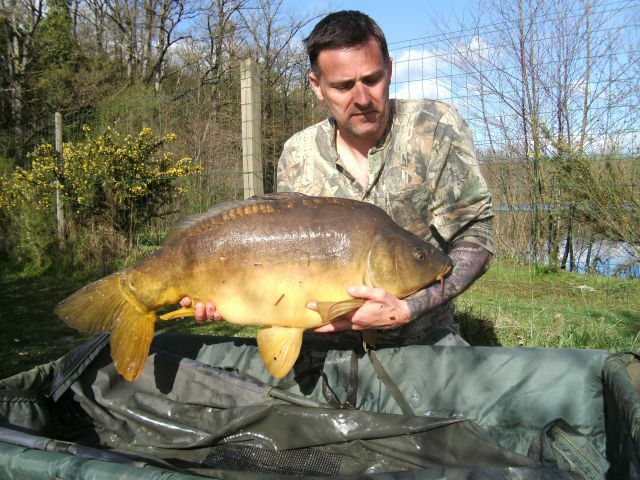 Medium sized boilies tipped with yellow, over big beds of pellets. 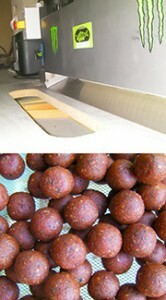 The pellet was bought on site and is what the fish get fed on in the winter so ideal. Not my usual style of fishing so it made a refreshing change to have a lake full of features. Food was excellent, home cooked means home cooked & very well too. Breakfast baguettes were awesome! Stay near your rods as all the takes were one-toners! I think the fish have been fed on steroids… They fight like demons and take off like trains as soon as they feel the hook! 20 fish ranging between 15lb and 33lb. 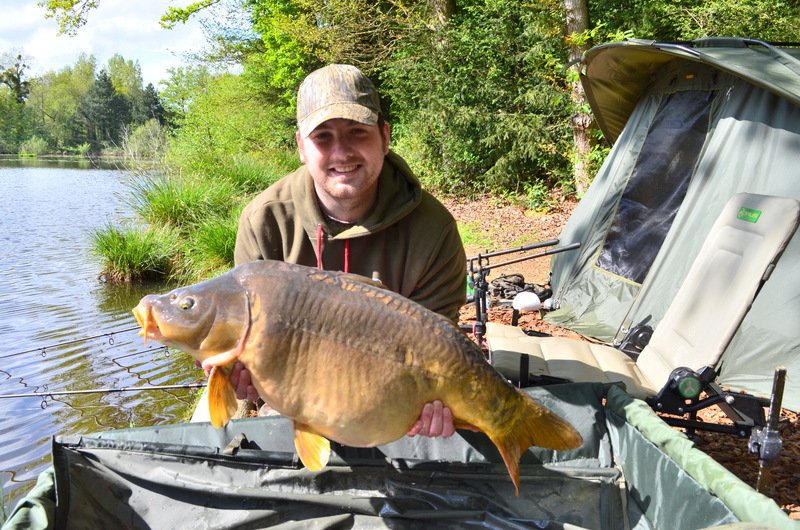 With lots of features to fish up to this lake was productive from all areas. We found that the lily pads kept attracting the fish but fishing amongst them meant we were always close to the rods. 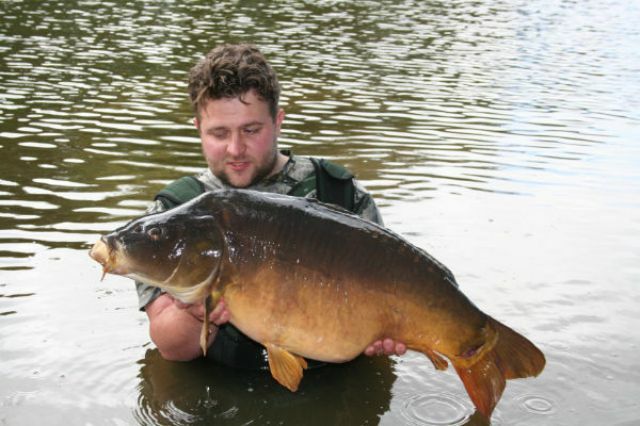 We found that most fish were caught using the chod rig with either chilli chocolate or fruity trifle quest pop-ups. 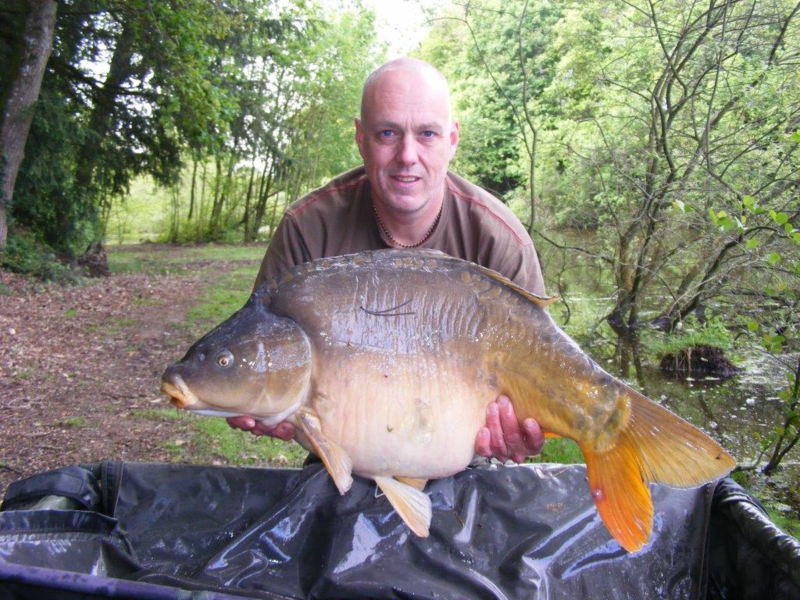 What a great weeks fishing on a lake that reminded us of an old English stately home lake set in the woods. 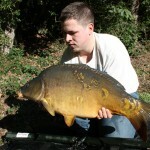 Dan was very helpful and knows his lake and how to fish it very well. 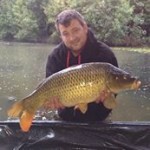 On site rolled boilies by Premier baits and matching pop ups. 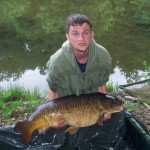 12 fish from high twenties to 47lb 7oz mirror which was my PB. 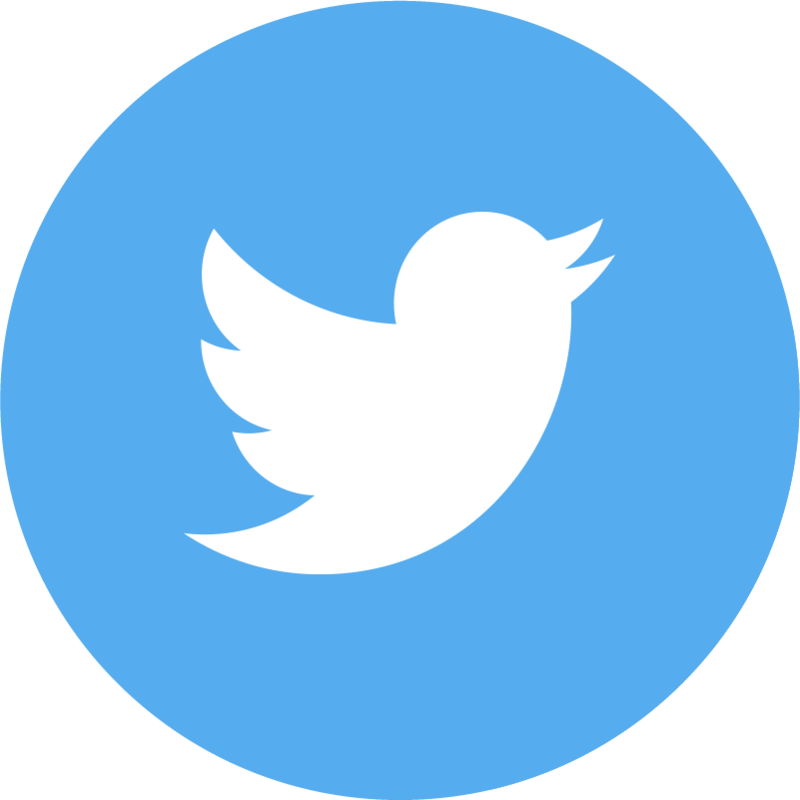 General comments: Lovely place, welcoming hosts and very peaceful. 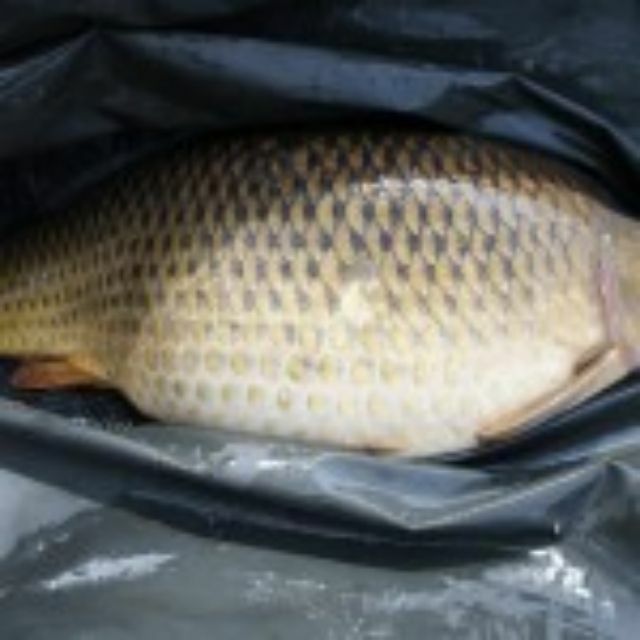 Fishing was great Food package is a must, brilliant. 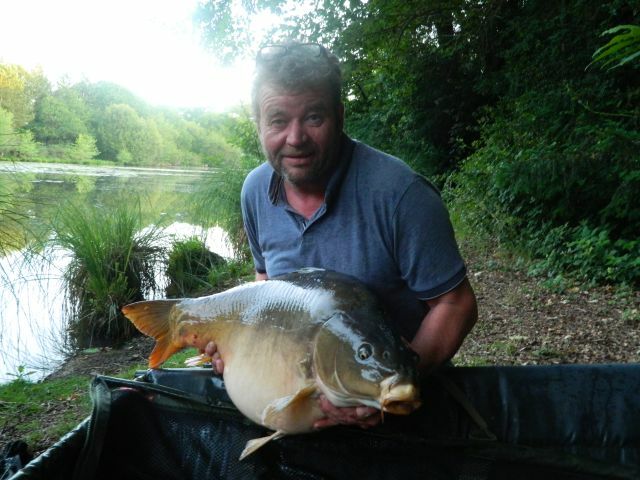 General comments: Nice 5 days fishing while on a longer vacation in France very scenic spot in woodland, mouths all in perfect condition some stunning dark commons, food was equally as good. Were the facilities what you expected? Everything you need including a fridge for this year a good new addition for the beers! General comments: Coming back for our third trip. Dans very helpful and Cheryl great cook. Always have the food loads of it and nice, fishing was great. 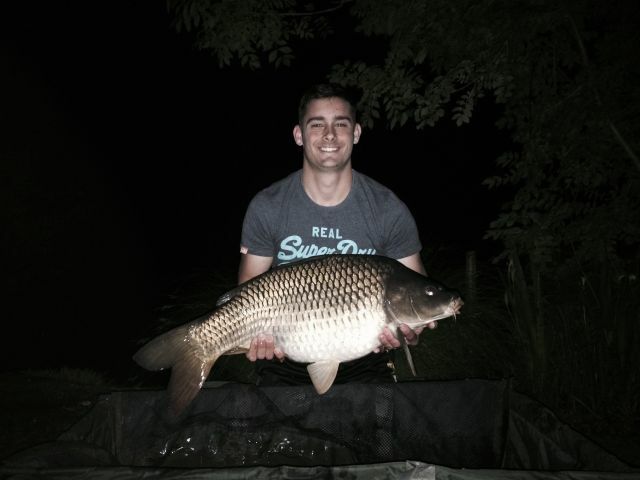 Your best tactics/bait/rigs: Lake Special and Tom found stalking them on the surface was a good tactic. 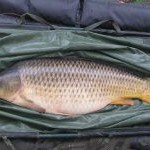 General comments: Pretty Fish, we had a linear and fully scaled mirrors, nice looking old mature lake with south facing swims. Good owners and we had the breakfast which is a must. General comments: A big thank you to yourself & Cheryl for looking after us again this year…the chicken pie is still a firm favourite mate ! 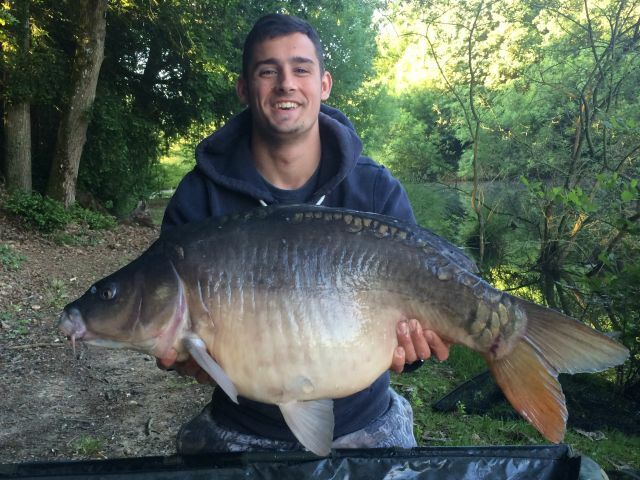 As ever the lake ,fishing and condition of the fish was fantastic although I think our session coinsided with the fish just about to start spawning so was a little harder than expected but equally as rewarding once we got a few on the bank ! I really appreciate you taking the time to pass on your lake knowledge to Bradley and that “top secret rig” which I think he may of perfected himself now looking forward to coming back next year and hopefully back amongst the 40′s again like last time with my brace. 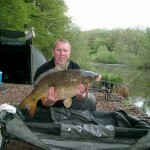 General comments: Beautiful lake, helpful advice on arrival, food was great and above all the fish are in great condition. 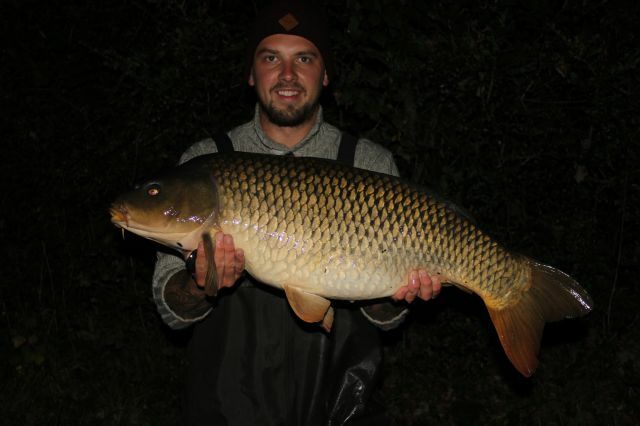 Details of your catches: Everyone had carp over 30lb with a new PB Common for Ryan at 32 lb Biggest fish 37lb Mirror stunner, the smallest fish 21lb common action straight away. 11 other 20′s mainly mid to high twenties. 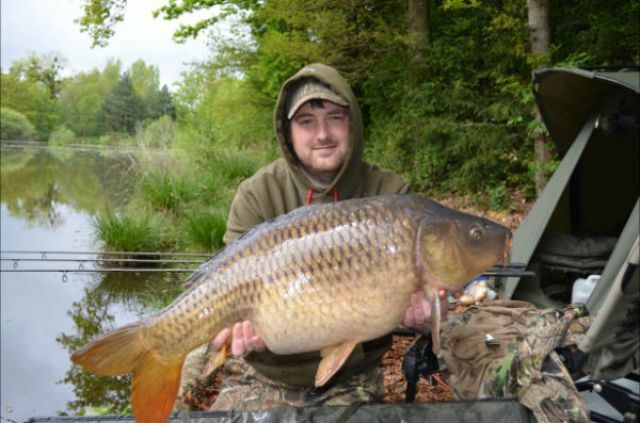 General comments: Great week, the lake looked very different at this time of year compared to when we last visited very pretty, beautiful fish one Pb to Ryan with a stunning common. The Action was mainly in day light hours. 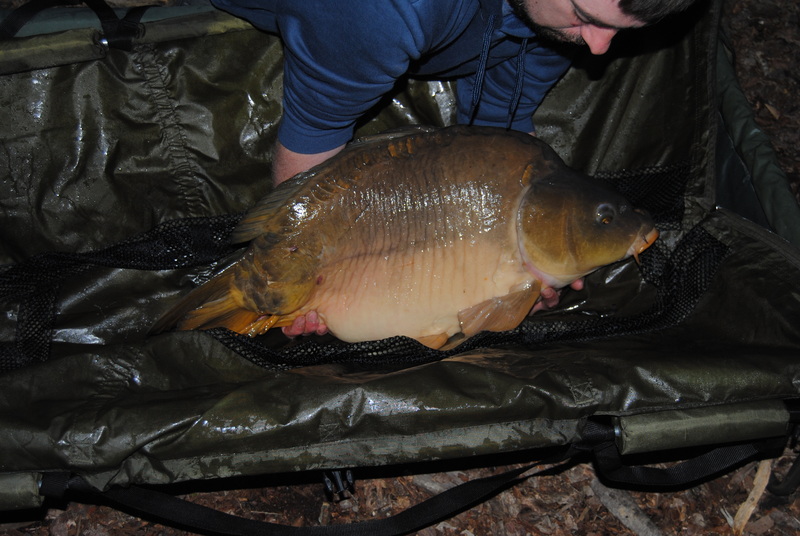 Details of your catches: The week started with my rod being dragged in on the first night. Lucky took the boat out on the Sunday morning and managed to retrieve it. 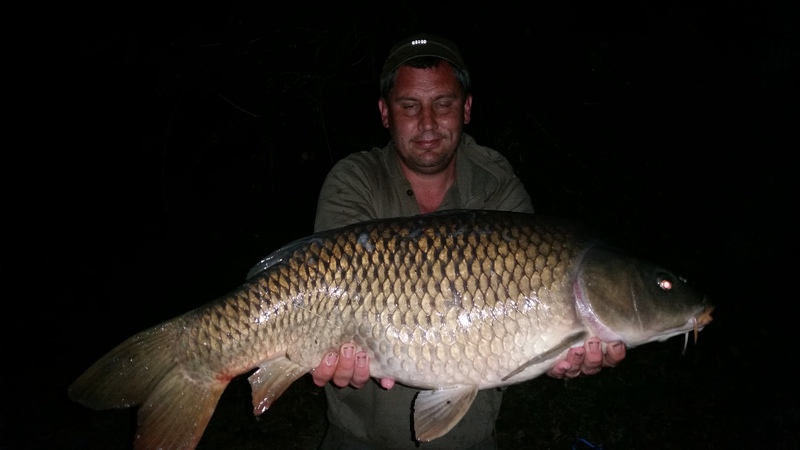 It was a bit of a strange week we only banked carp up to 26lbs its the first time we have visited and not caught carp over 30lbs. We did loose a fair number of big fish due to hook failure this is the strange part! We experienced hooks snapping and bending straight. (these were big brand hooks nash and korda) Not too sure what was going on as I use these hooks at home and have had no problem. 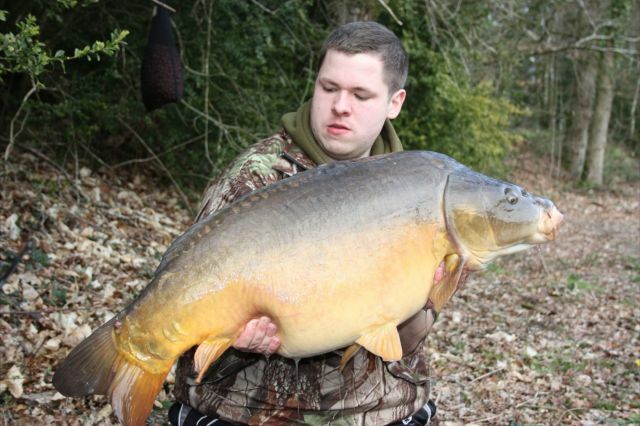 We suffered 4 losses due to this on decent fish. They were fighting particularly hard with the colder water temps but still you don’t expect this. One mid twenty common that was banked had also straighten another hook and we were lucky to land it. 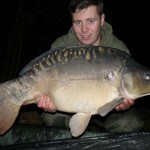 Had a few stunners though including some big plated mirrors and an offspring from the perfect linear at just over 20lbs. 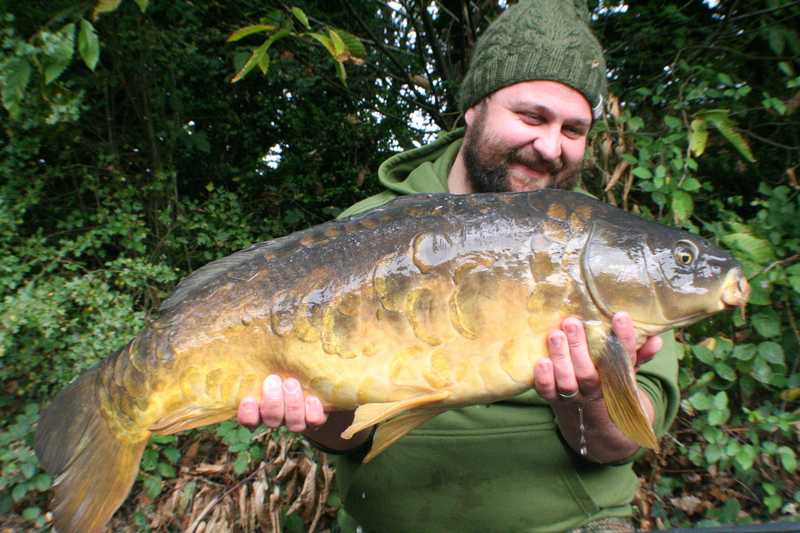 we have caught the perfect linear before and this little one is almost an exact replica stunning. 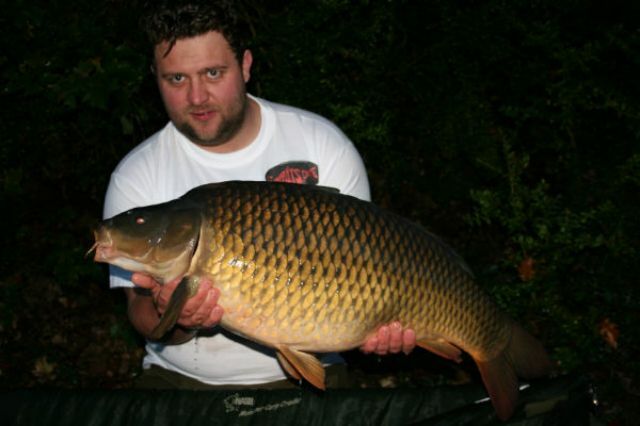 Be back in April as my quest for the Black common goes on! General comments: Great week as ever, food/facilities top notch, the fish are in awesome condition and some of the prettiest i’ve seen. 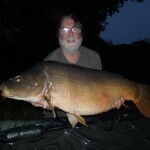 Details of your catches: 2 of us broke our PB’s myself with a 31lb mirror and my brother with a lump caught off the surface at 46lb 4 oz, which was a new record at Oakwood for a surface caught fish. 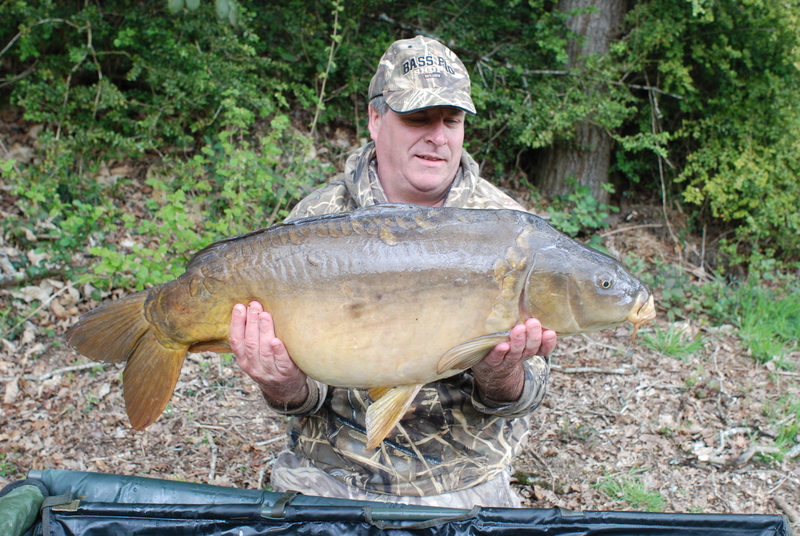 The other fish we caught ranged from 16lb – 33 lb with most being mid to high twenties. Your best tactics/bait/rigs: longer hooklinks single boilie tipped with corn and snowman rigs fished over a bed of lake special boilies and surface fishing. 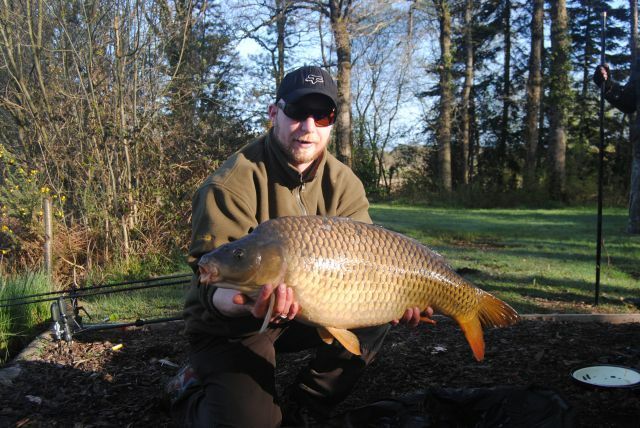 General comments: The Surroundings and the lake are stunning plenty of large carp to go for. 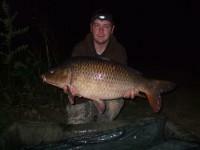 Well run site with fish safety at the forefront which is evident from the condition of the carp.. Helpful information from Dan who is always willing to help. Can’t wait to come back next april. Thank you to you and your good lady for an enjoyable weeks fishing and great food. 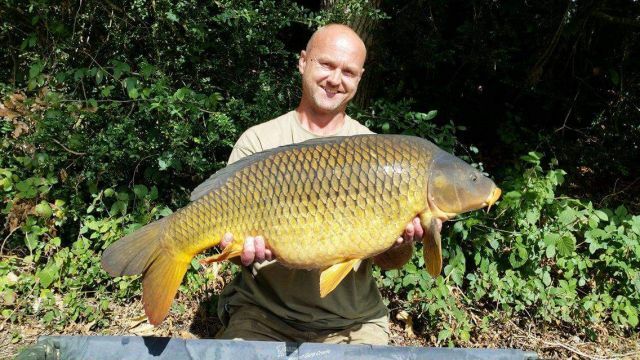 General comments: I’d like to take this opportunity to thank Dan & Cheryl for their warm hospitality throughout the week I spent at Oakwood fisheries . I was immediately made to feel welcome and Dan was really helpful in tactics and bait to use . I soon had my first capture from one of the spots Dan had pointed out . 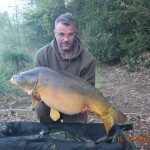 I went on to capture a total of 22 fish up to 38lb with an additional six fish lost . The fish are stunning , in excellent condition and fight hard so be prepared ! 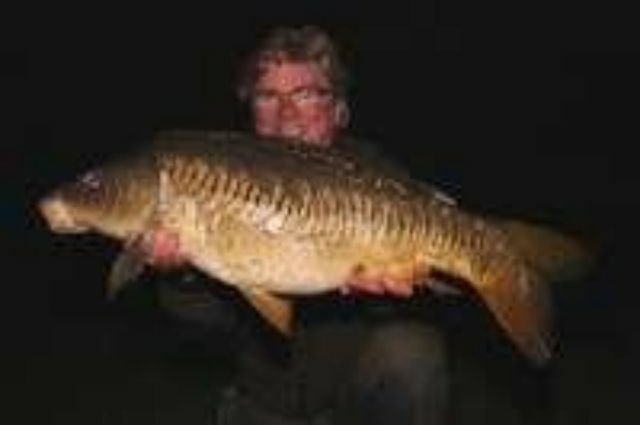 … Dan also supplies fresh quality bait at a very reasonable price ( I used it to great effect )… The facilities were excellent and very clean … Cheryl’s cooking was fabulous ! 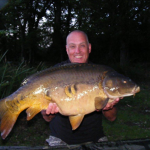 Highly recommended ( I guarantee you will not go hungry ) The lake is very picturesque with some great features to fish to , the pegs have plenty of room and are easily accessible . In summing up I had a fantastic week , the fishing exceeded all my expectations and more ! 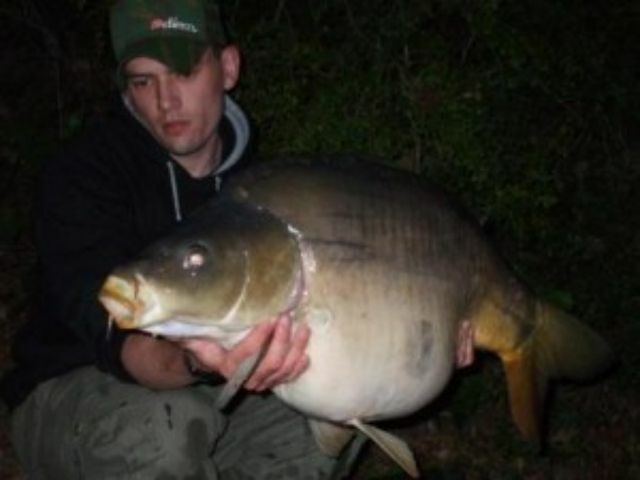 … I will definitely be back in the future , my tip for catching !.. 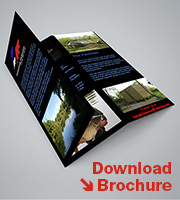 Listen to Dan’s advice he knows his lake , his fish and how to catch them ! Thanks for everything …. Kind regards , Ciaron Jordan . 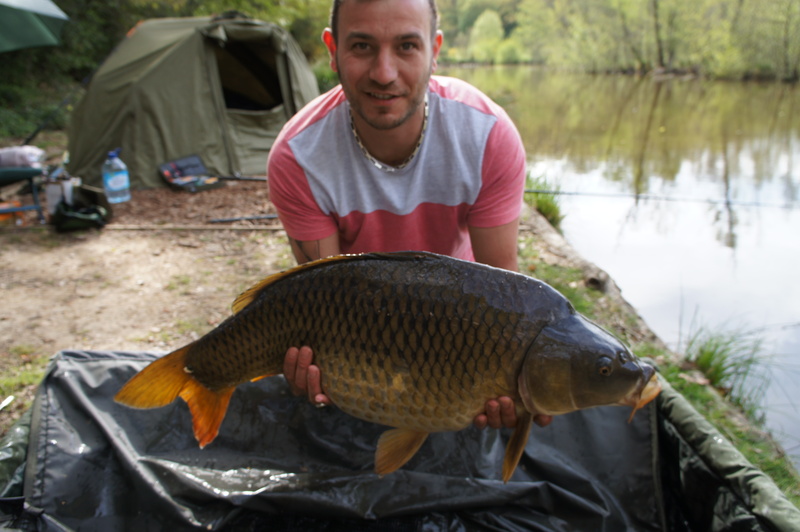 General comments: Beautiful lake, fish in perfect condition and good food and plenty of it. 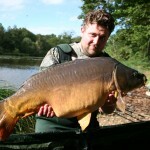 Your best tactics/bait/rigs: Accurate bait placement Kd rig and lake special boilies find your spot and stick with it. 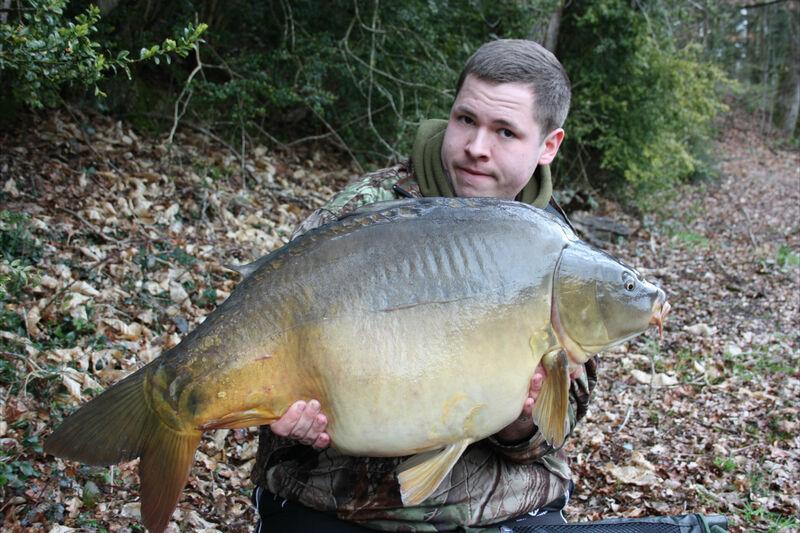 Details of your catches: We had 18 fish between us mainly between 25 – 35 lbs, Pick of the fish were a perfect zip linear at 33lbs and a great proportioned mirror of 46lb 10 which was a new PB for me. General comments: We had a great holiday very helpful hosts listen to dans advice. very beautiful lake with mature woodland surrounding it. Will be back in the future. 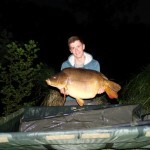 General comments: Great place to catch a pb, had a great week. Dan gave us good advice , and the food was superb should have had it all week saves a lot of hassle, wildlife was superb will take a better camera next time ! 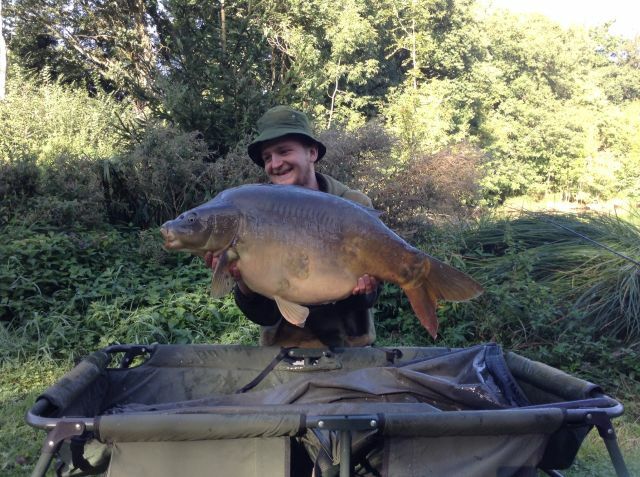 Details of your catches: 3 x 30′s to 39lb 6oz, 8 x 20′s to 29lb 10 oz , 2 doubles and lost 7 fish. Your best tactics/bait/rigs: Bottom baits tipped with small pop ups tight to the lilys. Lake Special boilie worked the best by far I ended up leaving my cell boilies in the freezer to take home as they didn’t really like them and ordered some more lake special which was rolled fresh, great service and got to see the boilie machine in operation awesome! Were the facilities what you expected? Yes the food was lovely just like last time I was here, I would recommend it to everyone visiting. Facilities were perfect and the shower is great! General comments: Great trip overall . Caught far more than I expected and Dan and Cheryl were excellent hosts who did everything to make sure I was happy. 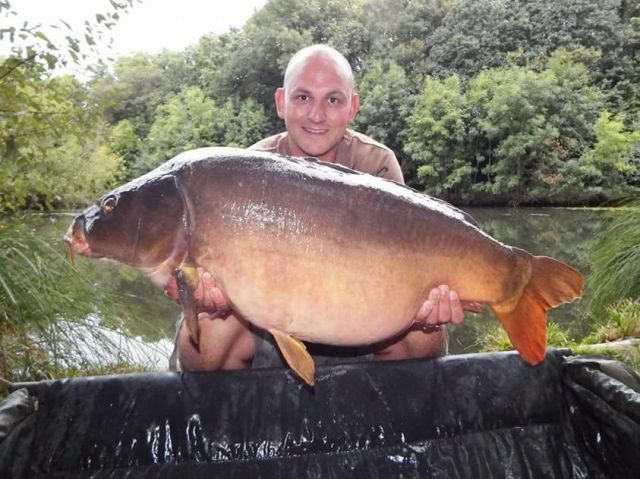 The lake is stunning this is my 2nd trip here and I was delighted to catch one of the linear’s at 32lb 2oz without doubt the best looking fish I have ever caught! 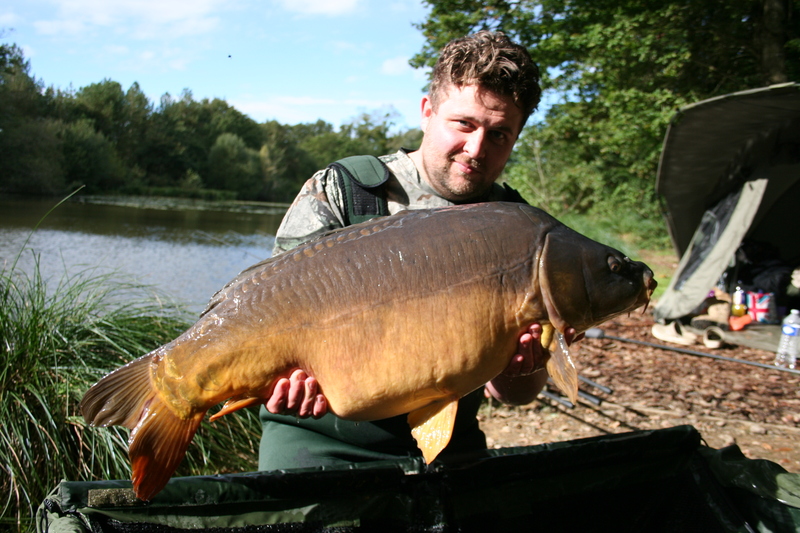 Details of your catches: A brace of 40lb mirrors, 4 x 30′s between 31lb 8 oz and 38lb 4oz, 6 x 20′s mostly high twenties and one double. 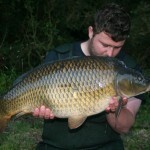 General comments: Great venue run by Dan who really cares for the fish which are in mint condition. Food was excellent every night gained a few pounds! Lake is a stunning estate lake, I rented the whole lake for 2 which I thought was very good value. 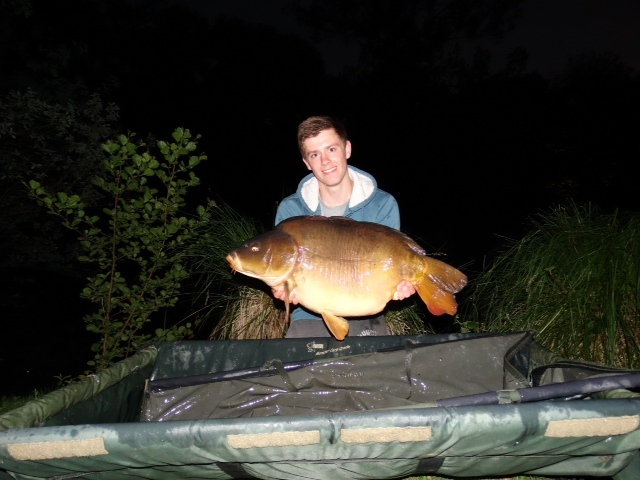 Details of your catches: 1 x 4o (new PB), 6 x 30′s including a beautiful linear, 5 x 20′s mainly high around 28/29lbs. 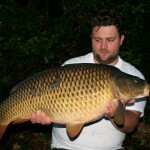 Your best tactics/bait/rigs: Double 18 mm bottom baits and snowmen, lake special boilie. General comments: dan was a great host full of information on where to drop our rigs listen to him and you will catch more. 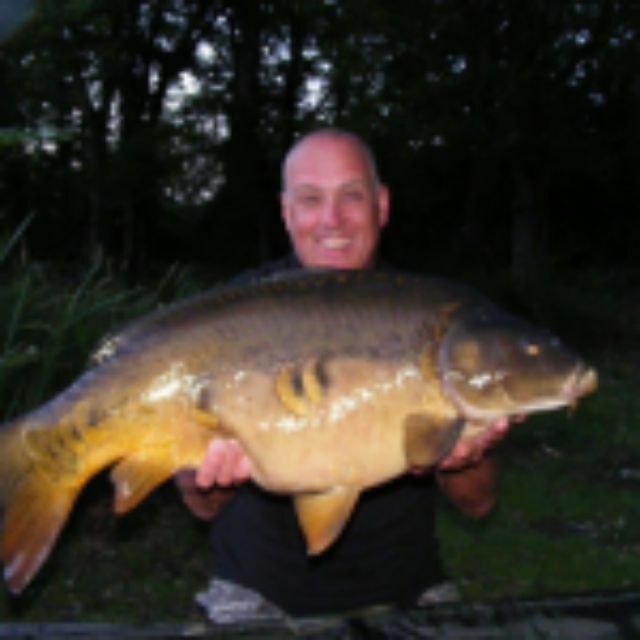 Stunning lake and fish in great condition we will be back. Were the facilities what you expected? yes very happy and the food was excellent. 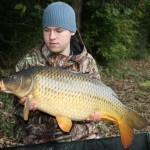 General comments: Very helpful hosts, struggled a bit at first and then Dan came down to offer some advice on where we should be fishing and even baited our spots for us. 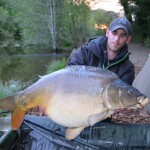 I was then onto the carp and ended up catching a new PB mirror which was stunning at almost 40lbs and several thirties. Your best tactics/bait/rigs: Bottom baits and snowmen, I couldn’t get a bite on just pop ups. 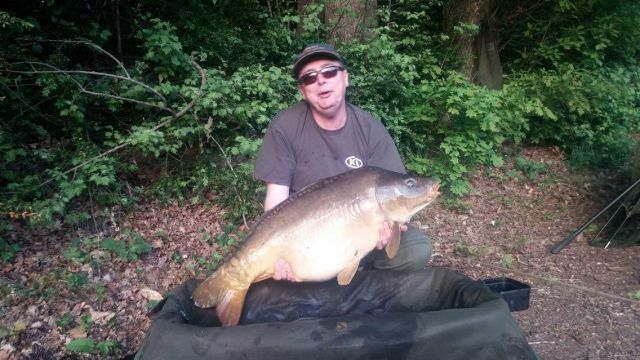 We used Matrix twist rolled on site at Oakwood Fisheries, fresh bait what a service. General comments: Great holiday hard fighting fish in great condition. 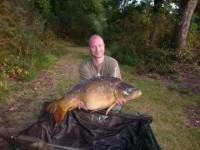 General comments: My 3rd year on the trot, great holiday, great fishing stunning fishery and a new PB. The food really adds to the trip aswell its a must! Were the facilities what you expected? Yes very good and Cheryl is a superb cook! General comments: Lovely mature lake with good wildlife. Comfortable big swims well managed lake. Your best tactics/bait/rigs: Beds of boilies, bottom baits tipped with corn. Were the facilities what you expected? Very amazing food well worth every euro! Your best tactics/bait/rigs: I found K-G-1 worked best. Were the facilities what you expected? 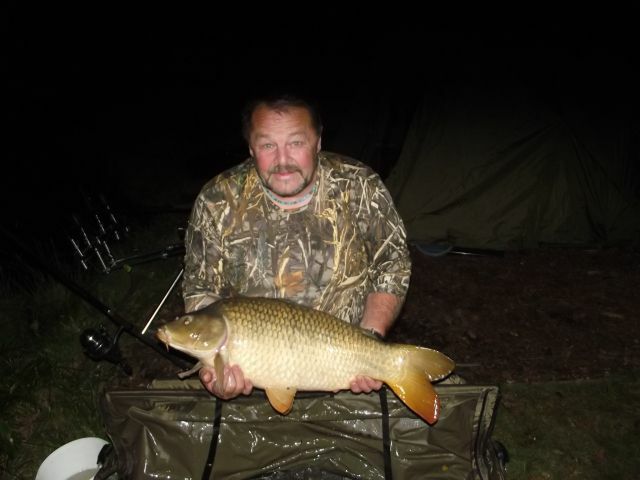 Very good combined with very tasty food and big portions and bait rolling on site what more could you want! General comments: Lovely lake, beautiful fish and very friendly helpful hosts. 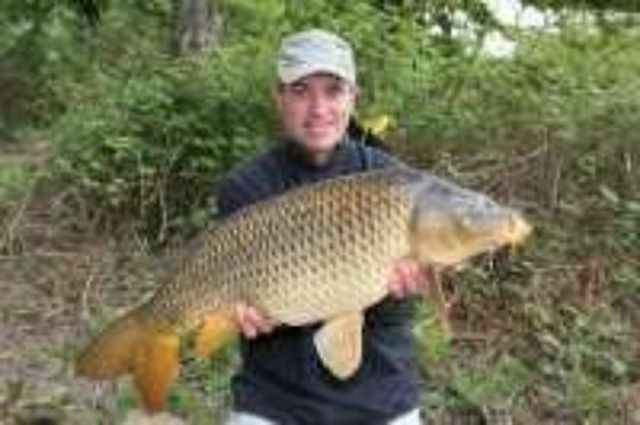 Details of your catches: 16 carp from 18 – 44 lbs very pretty fish and in great condition one of my favourites was a mint long linear of just over 30 one of the best fish I have ever caught. 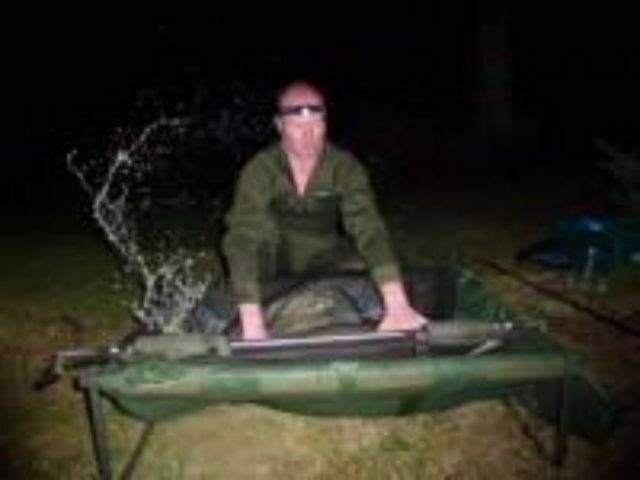 Your best tactics/bait/rigs: Plenty of bait with snowmen style presentation. I used matrix twist rolled fresh on site. Were the facilities what you expected? 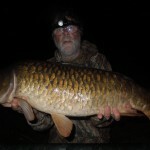 Above what I expected from a carp fishery, very clean awesome shower and great food all hand made. A lot better than most restaurants I have ate in on the side of a lake perfect! 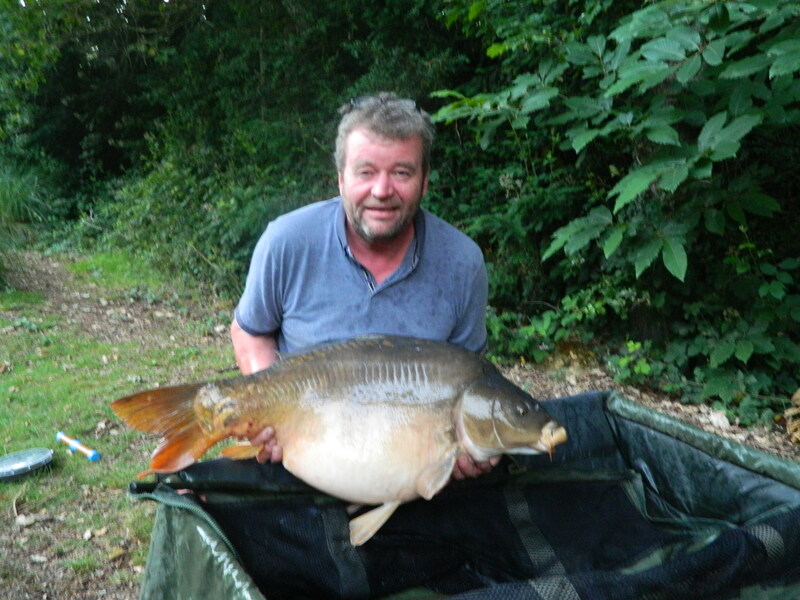 Details of your catches: Carp up to 29lbs new Pb and just missed the ladies Oakwood record by 2 lbs! Were the facilities what you expected? Yes very nice, excellent shower and no generators here all mains electricity for charging bait boats all very clean and tidy. General comments: Very beautiful well kept lake with excellent wood chipped swims nestled in a secluded valley. Nice surrounding area too where we enjoyed some days and evenings out. Details of your catches: Carp from low twenties to 41lb including a stunning thirty pound linear. 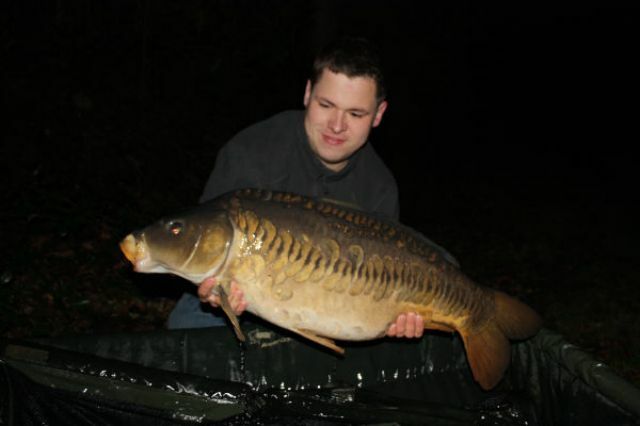 Your best tactics/bait/rigs: Kd rig with 18mm K – G – 1 or snowmen rolled fresh on site. General comments: Very beautiful lake lots of features and wildlife. 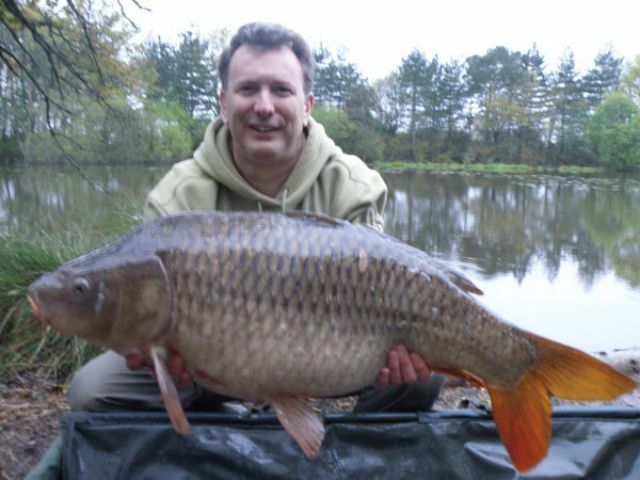 Details of your catches: 16 Carp both mirrors and commons from 19lb – 45lb 7oz new PB. Mainly mid to high twenties including 4 thirties and the mid forty. 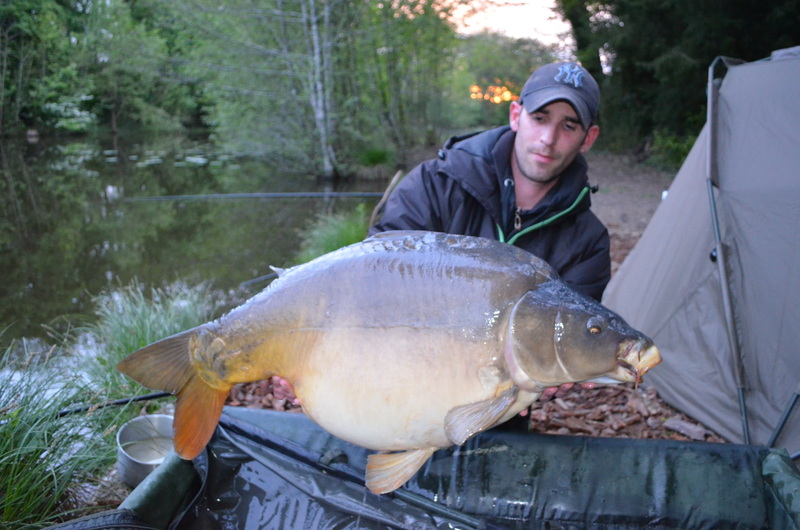 Your best tactics/bait/rigs: K – G- 1 and Matrix Twist rolled on site. Were the facilities what you expected? Brilliant factilities much better than I expected and the food was really good every night well recommended. 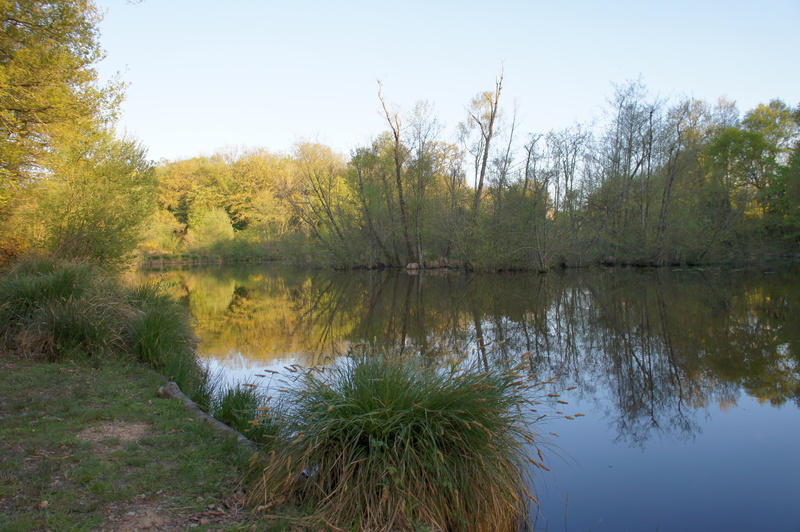 General comments: This is my 16th year visiting France and this is probably the most beautiful lake I have visited with great wildlife all around in the mature forest. 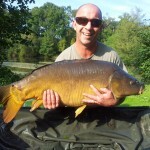 Well run fishery with nice hosts and contains some stunning fish all that we caught were in great condition. I will return again one year. Were the facilities what you expected? Shower spot on, food good value and nice breakfast roll delivered on the dot to your bivvy every morning. 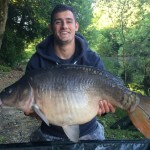 General comments: Lovely lake great spot and after a hard start to the week the fishing picked up after spawning and smashed my PB by over 17lbs! would definitely come again. 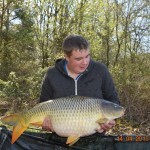 General comments: Nice Place Stunning Fish in great condition, lovely owners very helpful. General comments: Stunning estate lake packed full of features and cracking fish in good condition, food was absolutly great every night dont cook urself unless your a top chef no need fab! 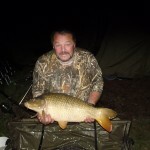 General comments: Really enjoyed stay, stunning place good fishing and excellent food with plenty of it, i smashed my pb by over 20lbs! 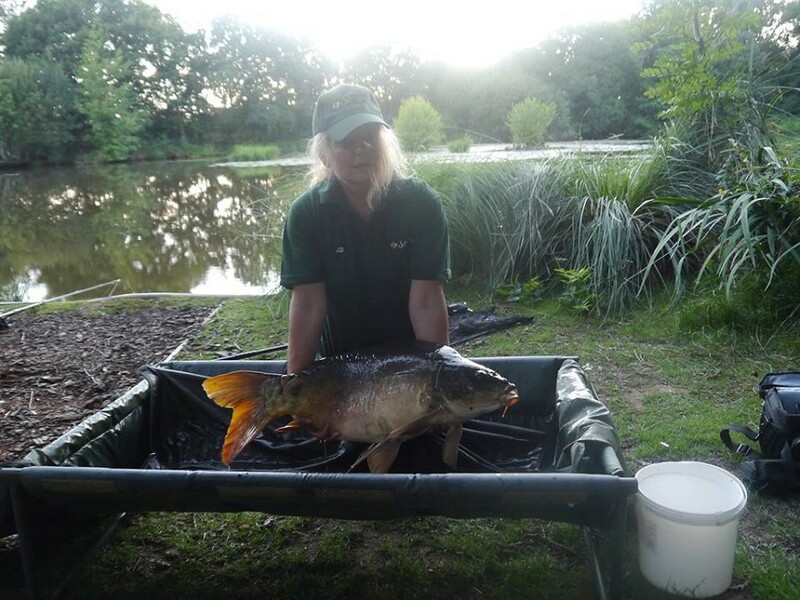 General comments: Lovely lake, loveley fish, food was great every night – thank you for helping feed two fishermen who normally live on tins! General comments: Beautiful site, abundance of wild life and nice comfortable swims. Your best tactics/bait/rigs: Premier baits matrix rolled on site and maggots in pva bags fished to a silty patch. Were the facilities what you expected? Very good, the covered seated area came in handy this week, food great as always and nice and clean. General comments: Terrible weather conditions non stop rain and howling winds accompanied with low tempretures made the fishing more difficult than our previous visits. General comments: My 4th trip here lovely place as always, food top notch, great trip away for 4 days despite some of the weather! 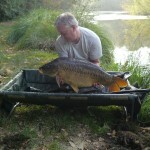 General comments: Lovely swims, beautiful old lake, well run fishery. Could drop off the fishing tackle in the swims which made life easy for my bad leg. Food great and dan very helpful. Were the facilities what you expected? Very nice, clean and tidy as always and awesome food. well reccommended. 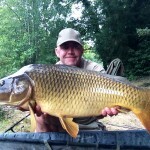 General comments: My 3rd trip now, beautiful lake, stunning surroundings, friendly hosts and plenty of near by shops. 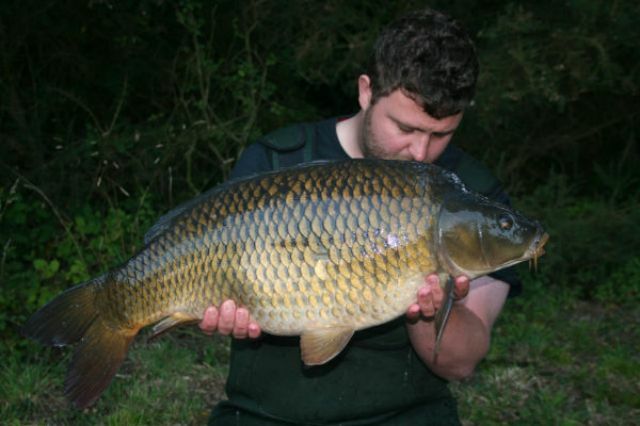 Your best tactics/bait/rigs: Plenty of boilies bait purchased on site and rolled fresh. Were the facilities what you expected? Yes very happy. 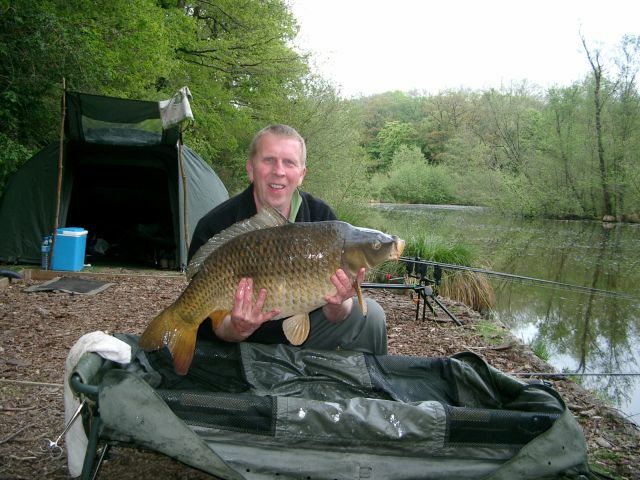 General comments: Fantastic place, great fish, really beautiful woodland setting with comfortable wood barked swims. Put my back out holding the 1st forty so lucky dan was at hand to hold the second one up for me! 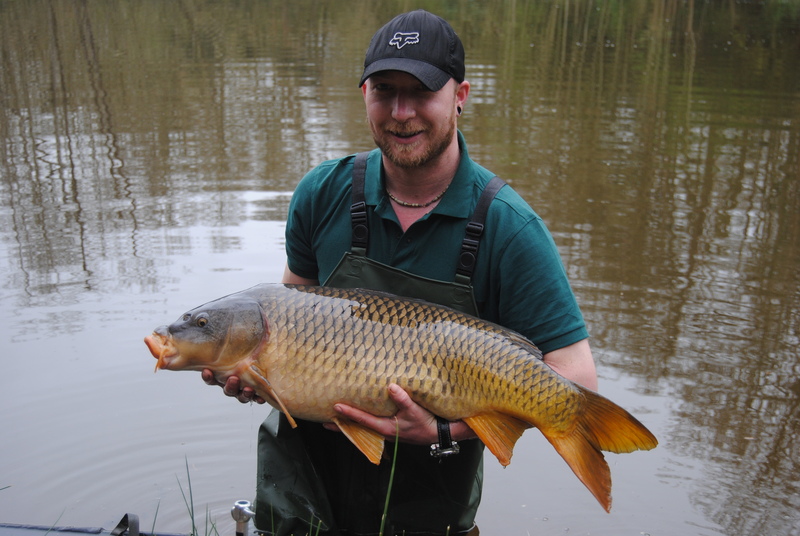 Details of your catches: 6 x 30′s, 2 x 20′s and 2 tench. 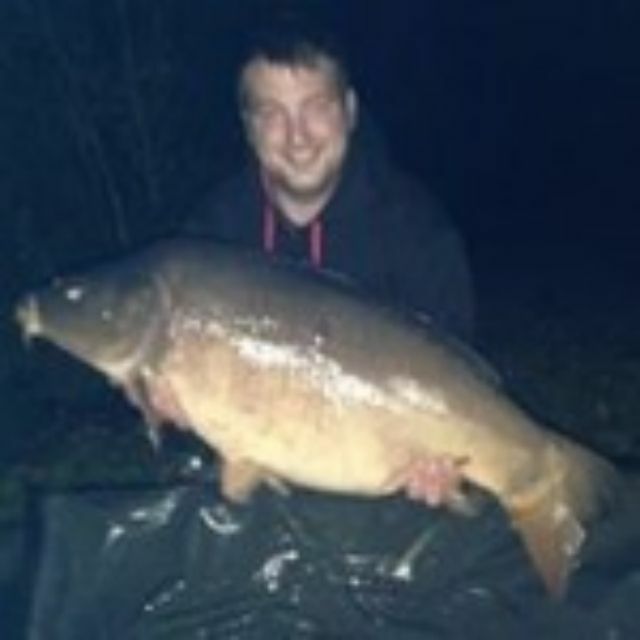 New PB within 24 hours smashed it by over 9 lbs with a 38lb 4oz mirror. 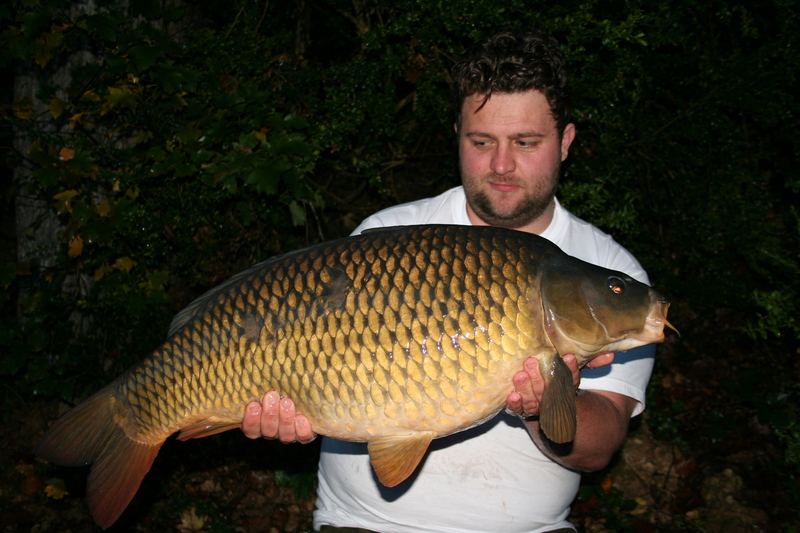 Your best tactics/bait/rigs: Large beds of Oakwoods pellet and lots of free boilies. General comments: Fantastic venue this is my 2nd trip, lovely fish dan is willing to help whatever is needed will be back again! General comments: Yes, we were very well looked after the food was excellent and very good value. Dan was very happy to pass on his experience and spent a lot of time helping my 14 year old son. 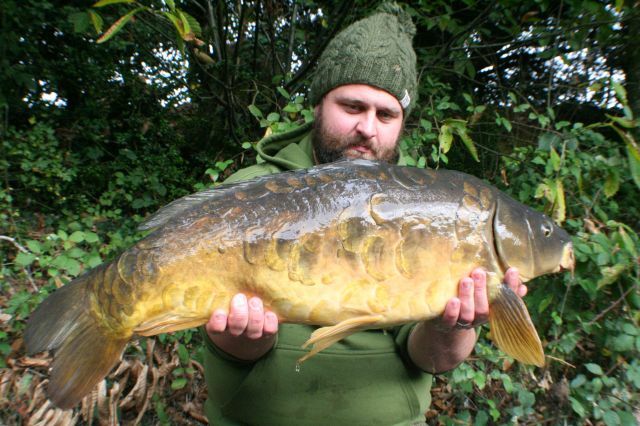 Your best tactics/bait/rigs: Boilies made fresh on site tipped of with oakwoods wonka pop ups. Were the facilities what you expected? Yes even a covered seated area which helped out as the weather was not very good. 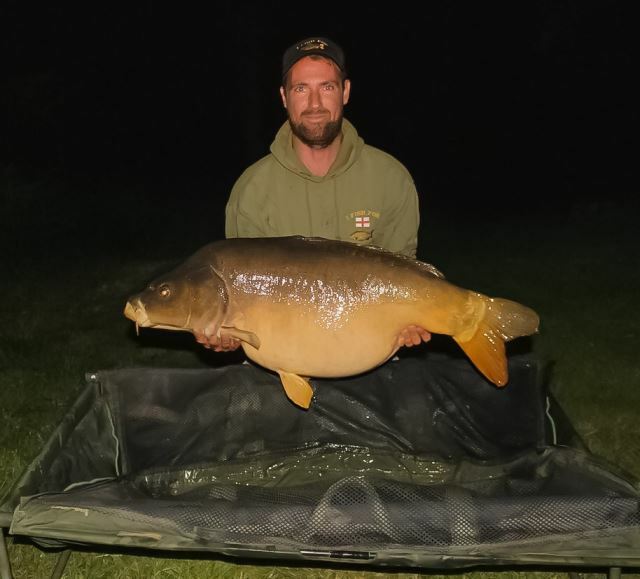 General comments: We had a very enjoyable trip, we find dan & cheryl very accommodating and helpful and the lake was very picturesque, with excellent pegs, great facilities, fantastic to have the lake to ourselves without any hassle from other anglers. We both thought the home cooked food was excellent and there was a ready supply of good quality bait on site. Thanks for your help with organising the trip. General comments: Stunning lake with many features. 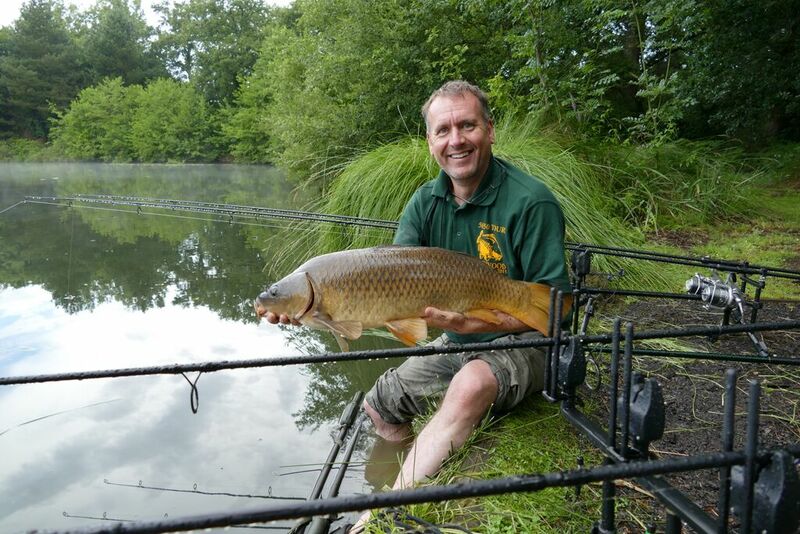 The weather was very changable caught all our fish after the rain had stopped when they started showing again. To have the food package was the best decision i made. 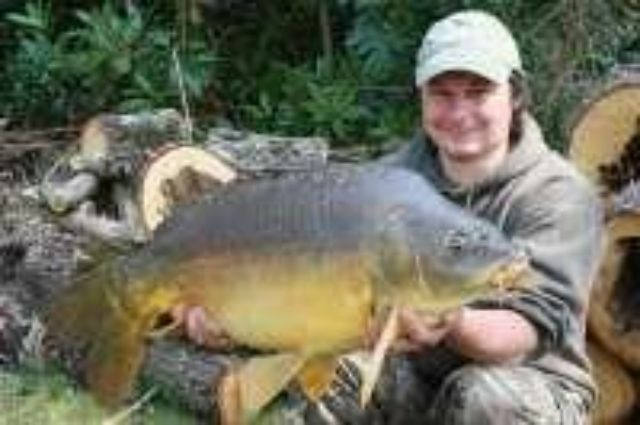 The quality of the bait available to purchase is also excellent and dan is very happy to share his knowlwdge of the lake to help improve your catch. We both broke our pb’s and rob broke his by 21 lbs! I would definatly recommend the venue and would be happy to return. Were the facilities what you expected? Yes, Nice and clean as always. General comments: As always a beautiful place to fish it was a bit colder than when I normally come and it was nice to see the lake looking different in her winter colours, despite the cooler temps I still managed to winkle some out showing me their lovely winter colours well worth the effort. 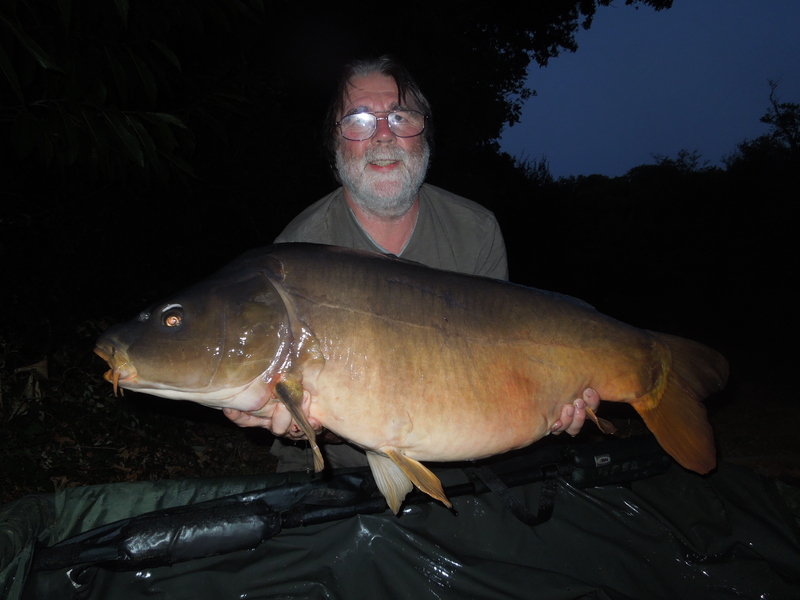 Details of your catches: I smashed my personal best by 10lbs thanks to a stunning mirror of 39lbs and dave added 6lbs to his p.b. 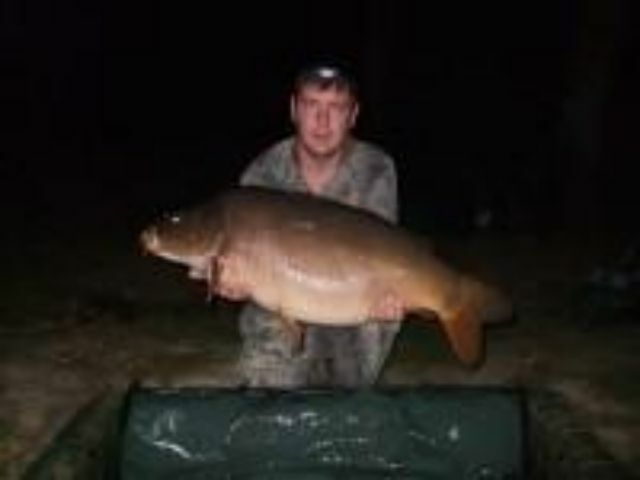 With a 29lb 6oz mirror. 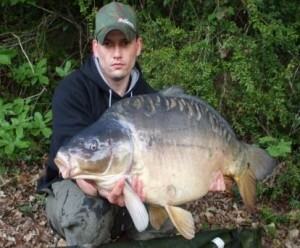 He also had 5 other high twenties including the nicest fish I have ever caught called the perfect linear at nearly 29lbs. 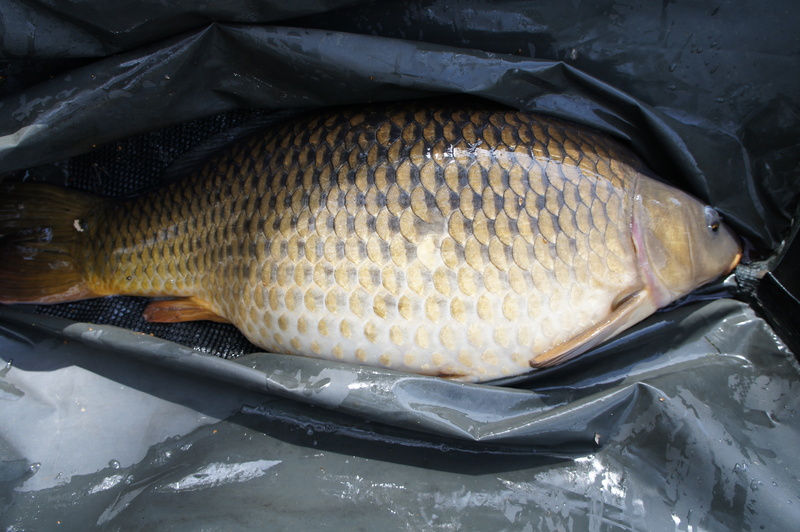 Your best tactics/bait/rigs: I fished to gravel areas with short hook links and large 20mm boilies with plenty of freebies. Were the facilities what you expected? Yes everything we need and plenty of space to store bait. 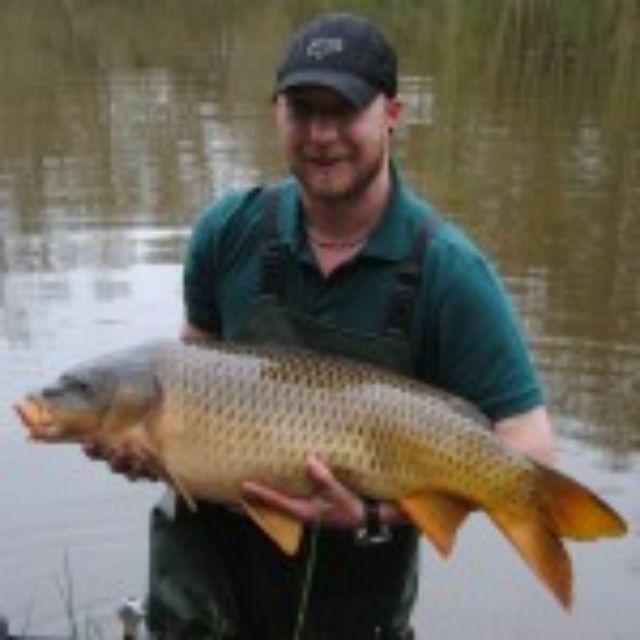 General comments: A very friendly and well run fishery. Lovely looking lake and great condition fish and some right stunners! Dan is a great help and always willing to point you in the right direction. Will plan to come again next year. 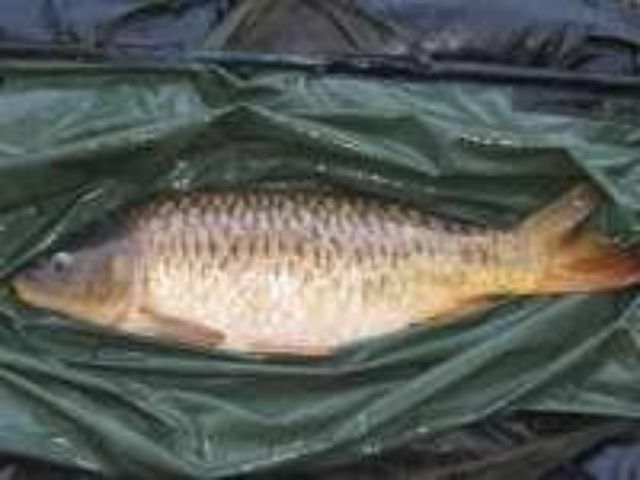 General comments: This venue has the potentially to be an extremely good venue, the fish were in cracking condition and large framed, so can well grow considerably bigger. Dan & Cheryl are both great people, happy to help. Worth trying Cheryl’s home cooking as well! 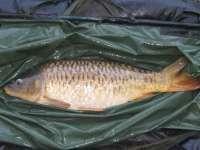 Your best tactics/bait/rigs: Bottom baits fishing on the gravel and in the silt. General comments: Beautiful lake, great hosts well thought out swims and great food, I will miss my bacon and egg baguette in the morning! 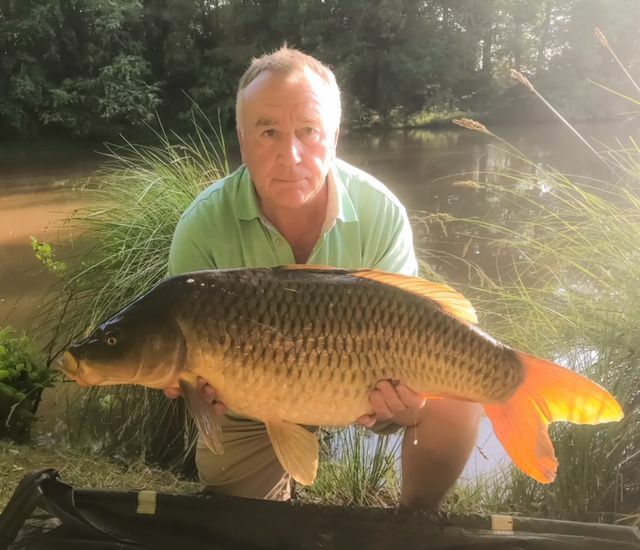 General comments: Didn’t catch as much as expected due to the very hot weather for 5 days, after the rain the fishing got much better and there were lots of fish moving. Excellent food and good hosts. 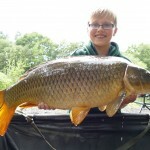 General comments: Very good fishing, we both broke our pb’s and my 14 year old son landed a 32lb mirror. Dan was a very good host and Cheryl’s home cooking was excellent and plenty of it! 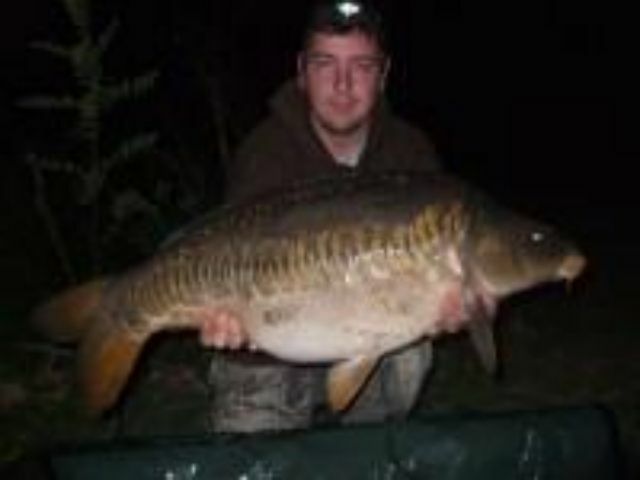 A well run and looked after fishery can’t wait to come back next year! 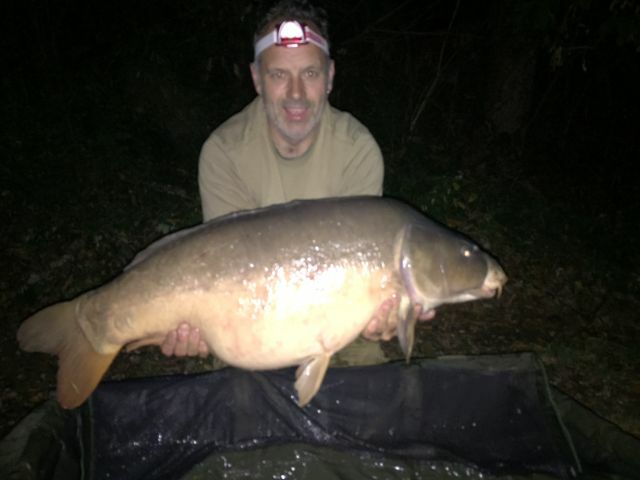 Details of your catches: Three of us broke our pb’s during the week, we had carp from 18 – 34lbs including a stunning 28lb linear. 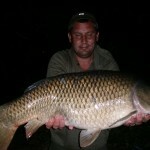 Your best tactics/bait/rigs: Sweet corn and 18mm bottom baits with pop ups. Were the facilities what you expected? Spot on. 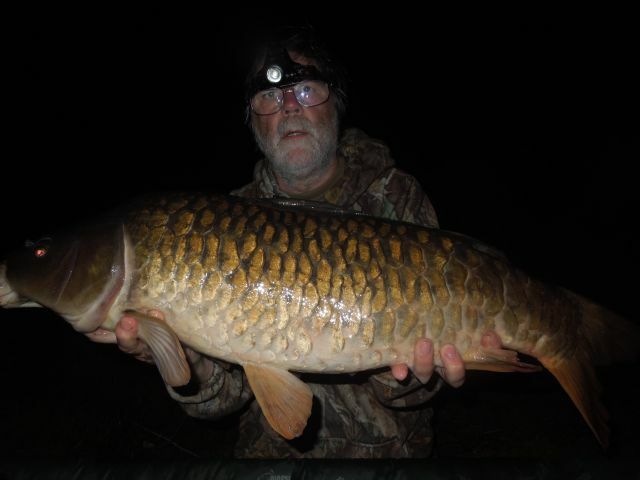 General comments: Happy with everything, the carp were spawning during the week so that was a shame but we will be back for a re-visit next year. Wish we had the food will do next time. 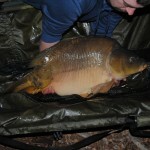 Details of your catches: 7 x 30’s to 37lb 4oz and 16 x 20’s. Your best tactics/bait/rigs: Fish were caught on both bottom baits and snowmen. All on boilies. General comments: Enjoyed the visit, an excellent week. Nice fish, good owners and the food was fantastic every night. A good set up, bang on, see you next year! 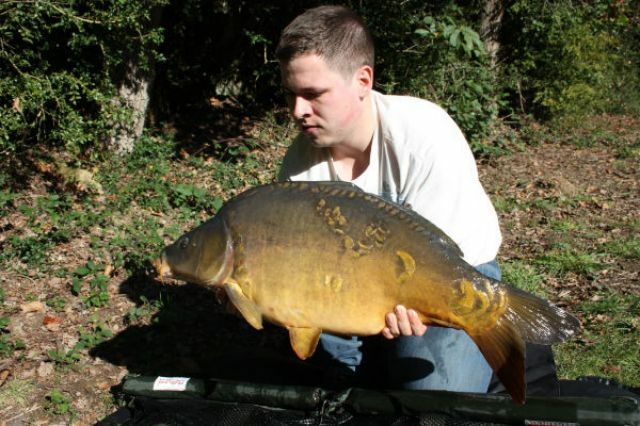 Your best tactics/bait/rigs: Medium sized boilies tipped with yellow, over big beds of pellets. The pellet was bought on site and is what the fish get fed on in the winter so ideal. 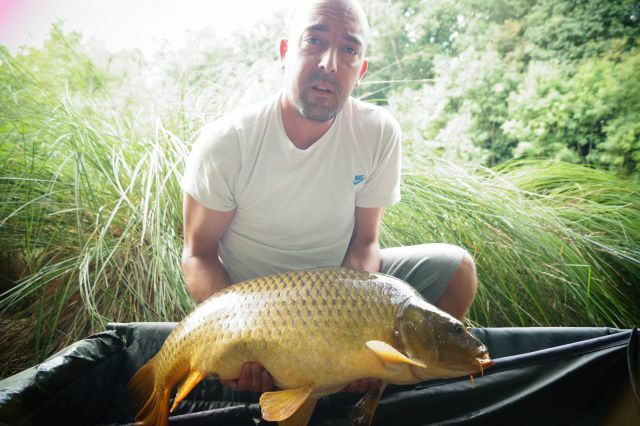 General comments: Not my usual style of fishing so it made a refreshing change to have a lake full of features. Food was excellent, home cooked means home cooked & very well too. Breakfast baguettes were awesome! Stay near your rods as all the takes were one-toners! I think the fish have been fed on steroids… They fight like demons and take off like trains as soon as they feel the hook! Details of your catches: I broke my pb twice so I can’t say more than that. 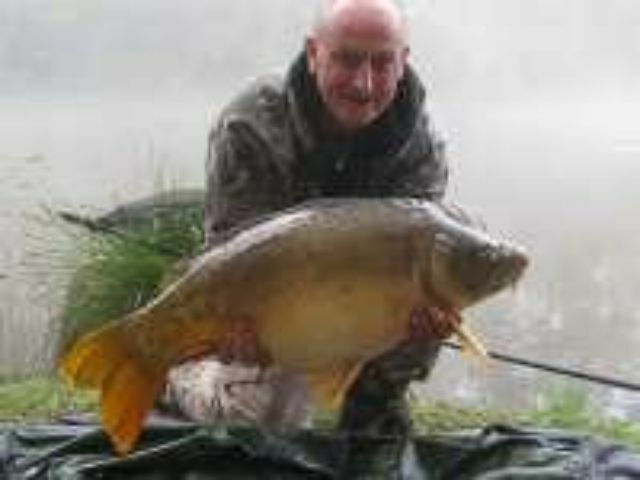 31 lb mirror first followed by another at just under 35lb had other mirrors ranging between 25-30 lb and a small common of 18 lb. Your best tactics/bait/rigs: Fishing to the far margin produced the takes. Were the facilities what you expected? Absolutely brilliant. General comments: Totally enjoyed my trip. It was my first trip to France and would definitely come back. Food was great an all-round pleasure to fish well recommended. Were the facilities what you expected? Better! 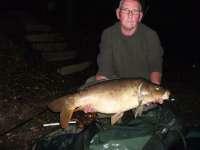 Your best tactics/bait/rigs: We used mainline bolies and fish to lily pads, weed beds and far margins. Were the facilities what you expected? Hydrostatic shower oh yes!! General comments: A great holiday was had by all, beautiful lake, stunning fish and great hosts, we just needed a few more days! 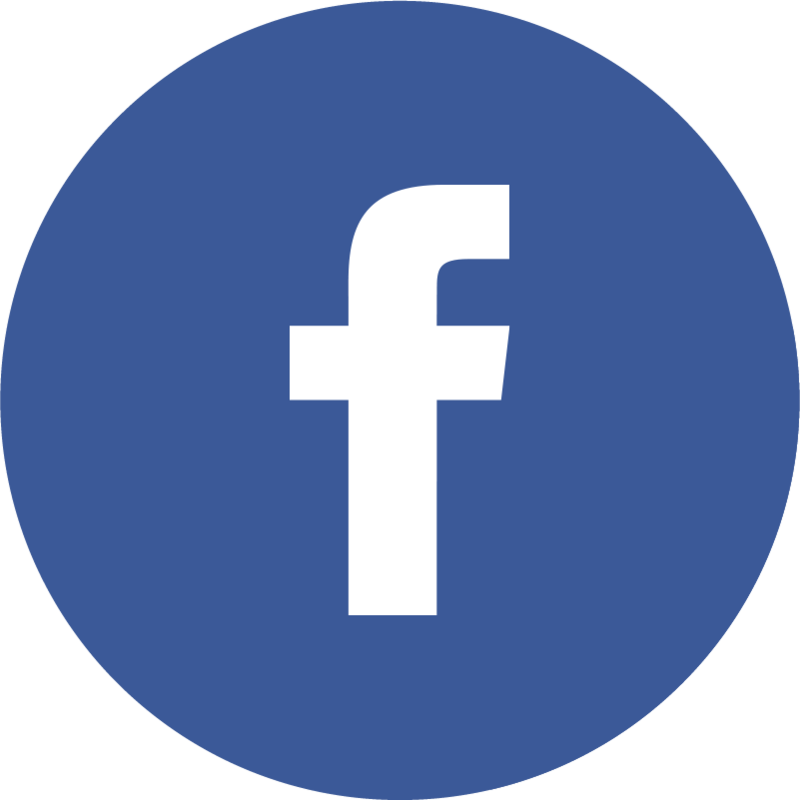 General comments: A beautiful, peaceful venue with great hosts and facilities. 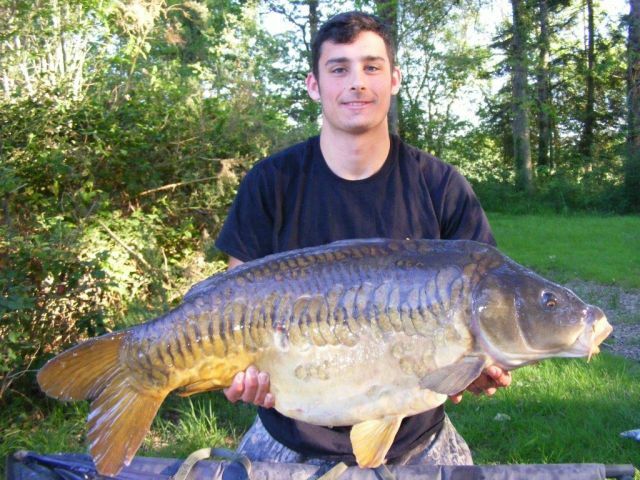 Stunning fish particularly the linears, but would benefit from a some bigger fish stocking. General comments: This is a very pretty lake, and surrounded with great wildlife, red squirrels, kites, dear – truly stunning. Really enjoyed the week, nice and secluded in stunning surroundings. Name of customer: Samantha Collins-ratcliffe Mainline consultant. 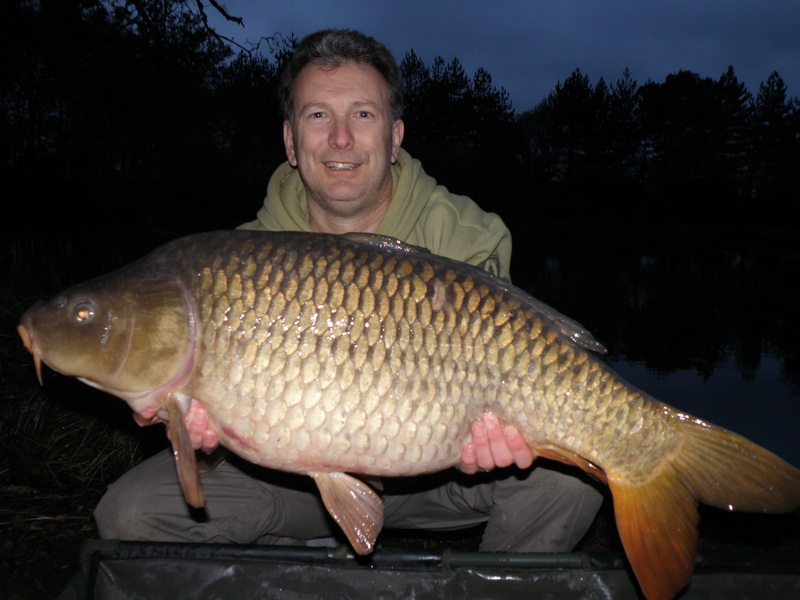 Details of your catches: 20 fish ranging between 15lb and 30lb. 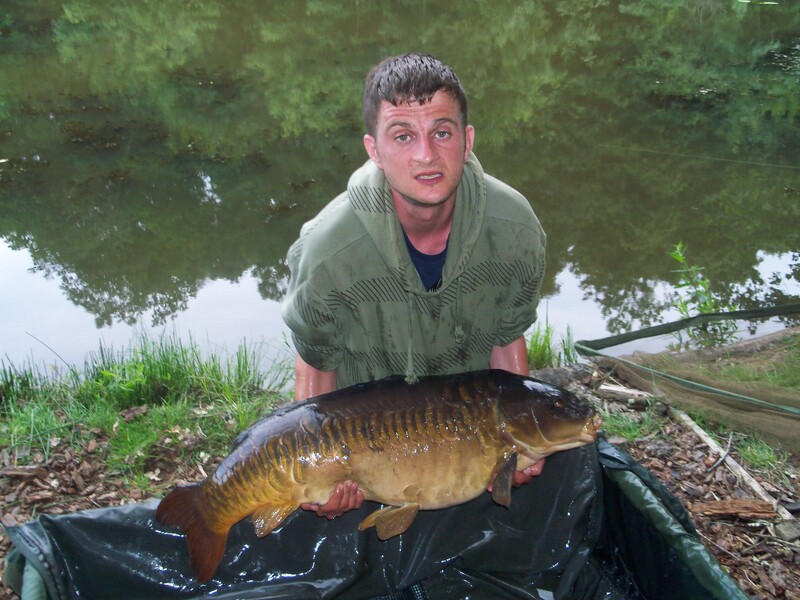 Your best tactics/bait/rigs: With lots of features to fish up to this lake was productive from all areas. We found that the lily pads kept attracting the fish but fishing amongst them meant we were always close to the rods. 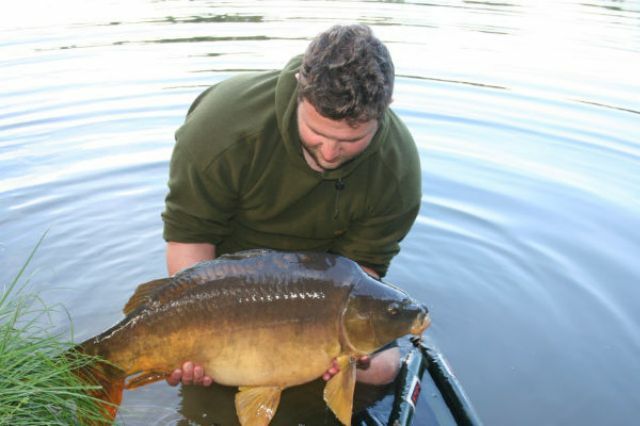 We found that most fish were caught using the chod rig with either chilli chocolate or fruity trifle quest pop-ups. 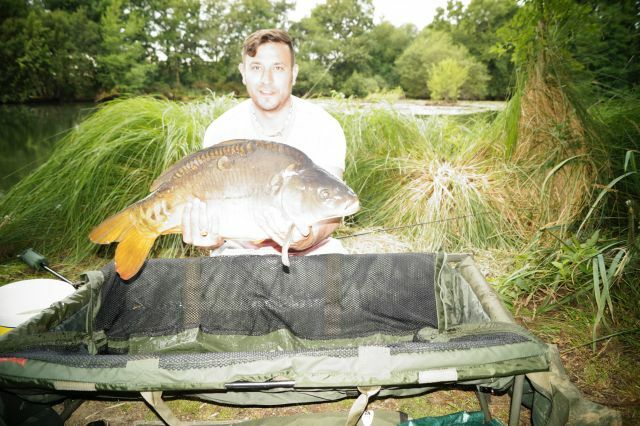 General comments: What a great weeks fishing on a lake that reminded us of an old English stately home lake set in the woods. Dan was very helpful and knows his lake and how to fish it very well.